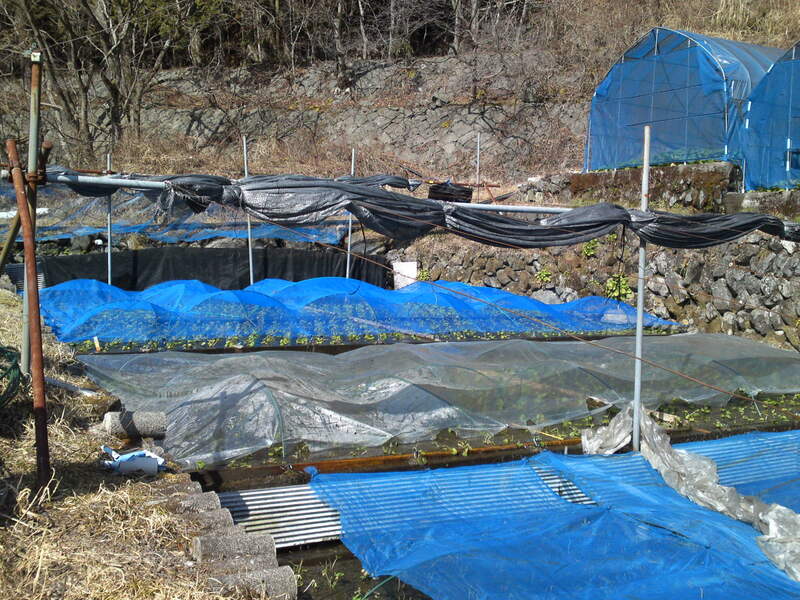 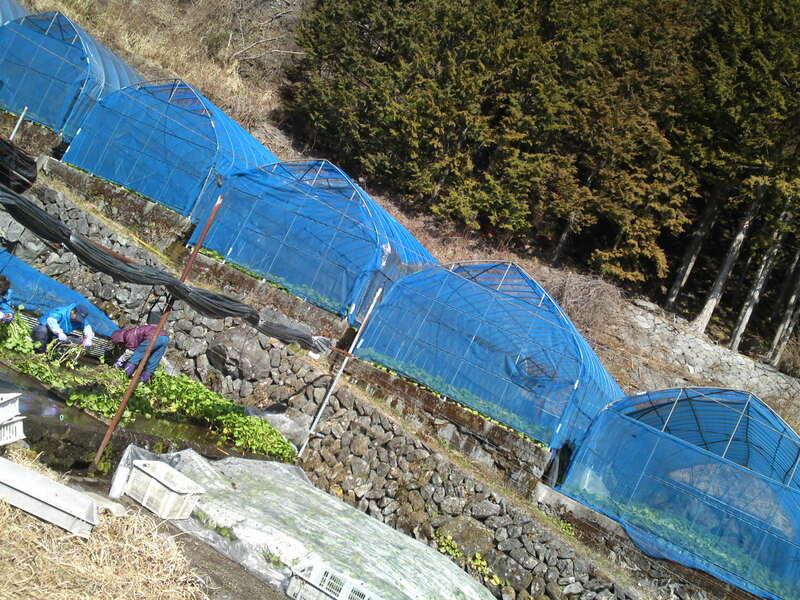 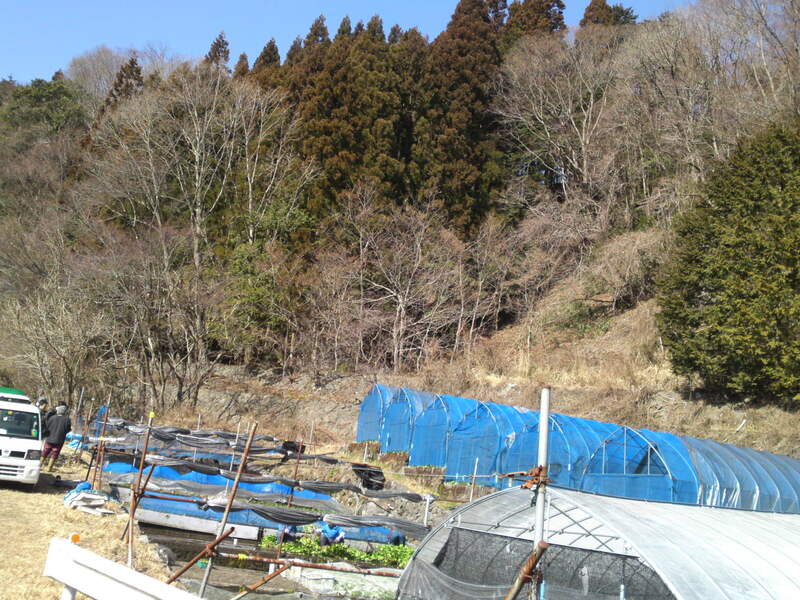 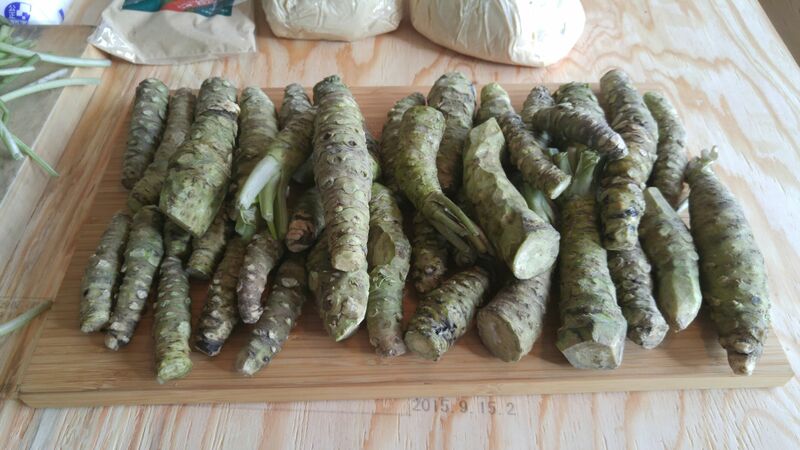 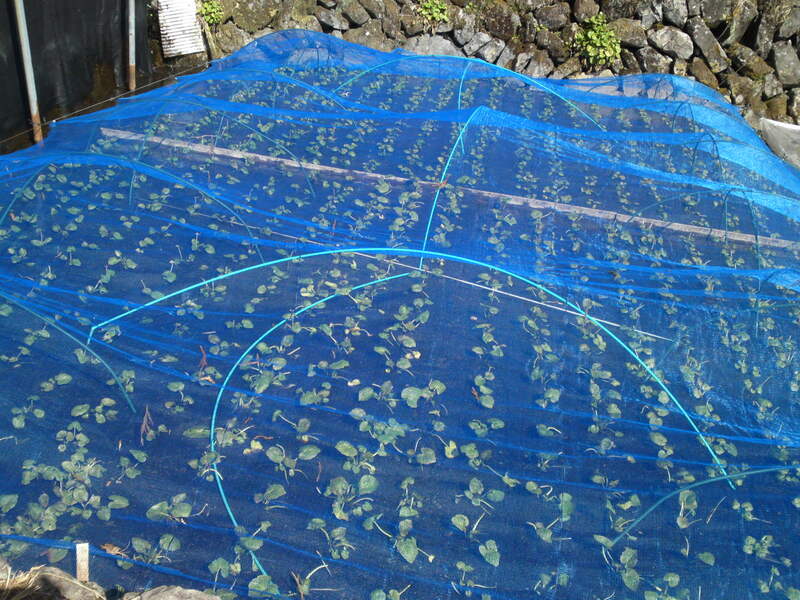 Wasabi Grower: Masahiro Sugiyama/杉山昌弘 in Umegashima, Shizuoka City! 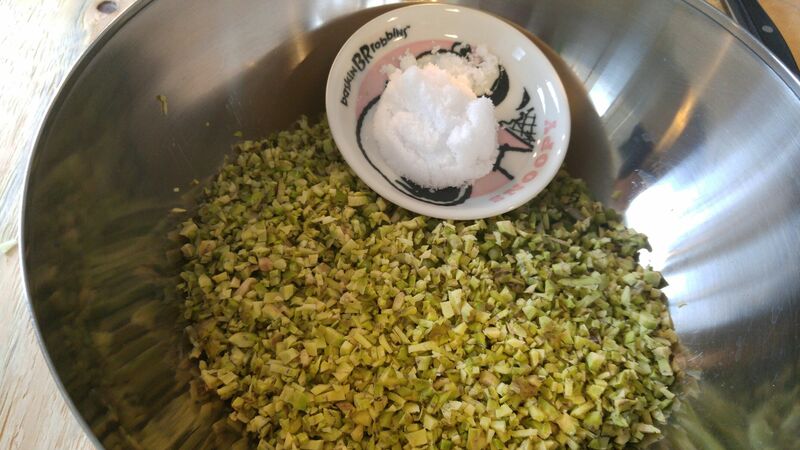 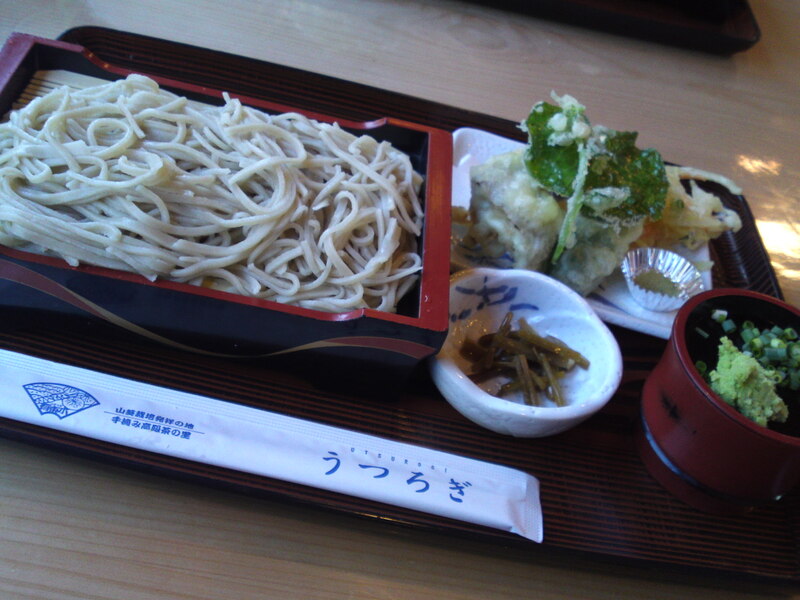 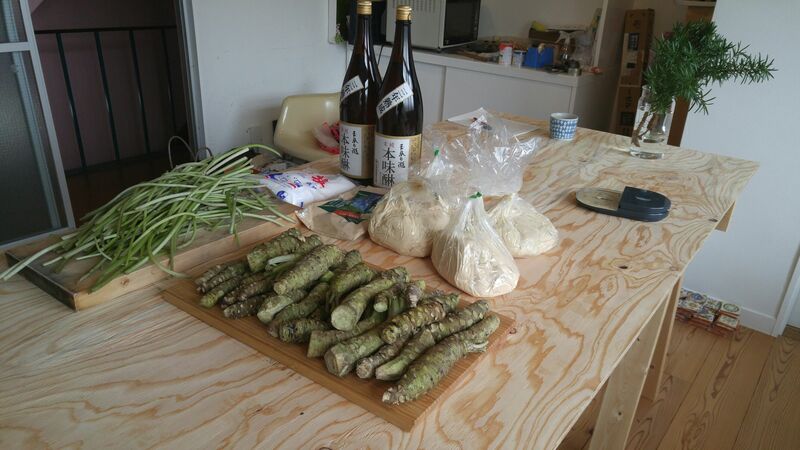 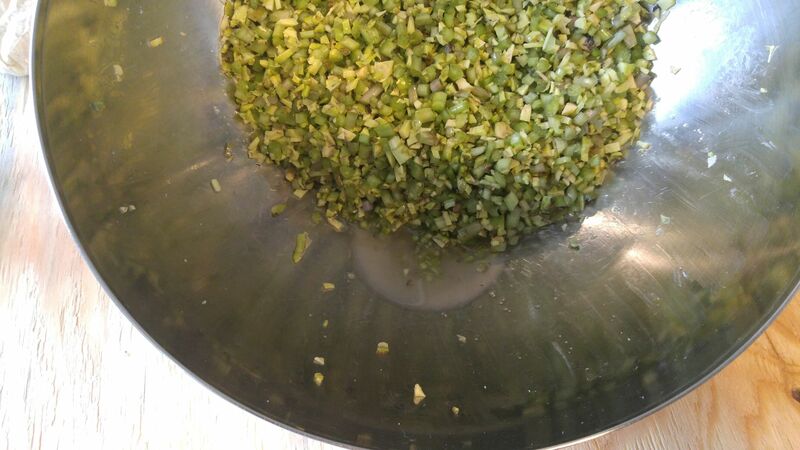 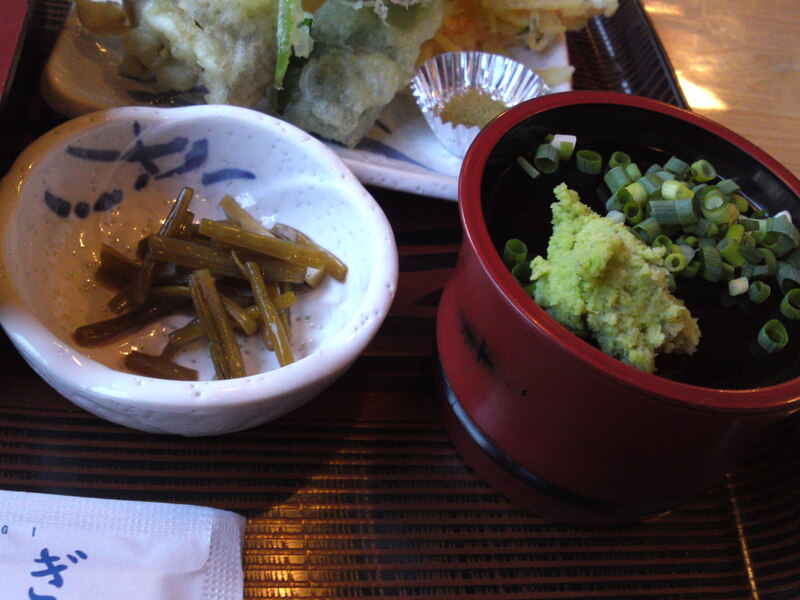 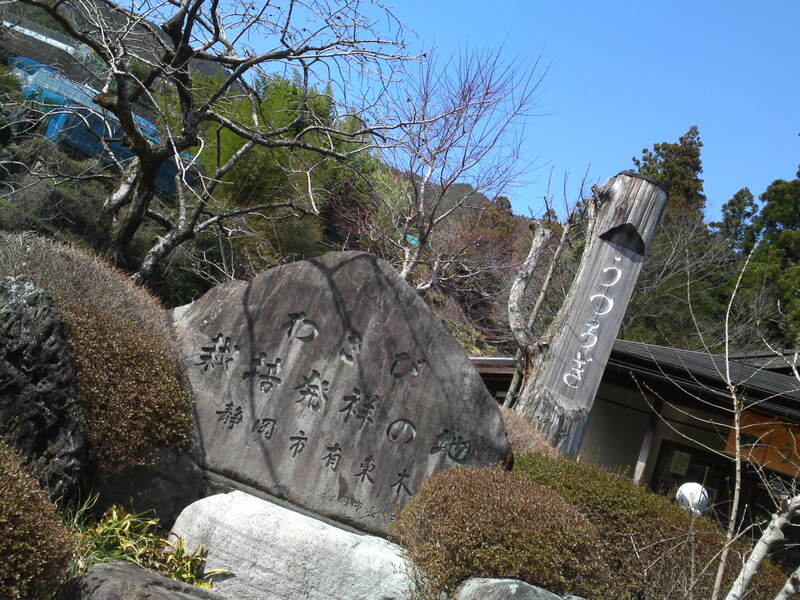 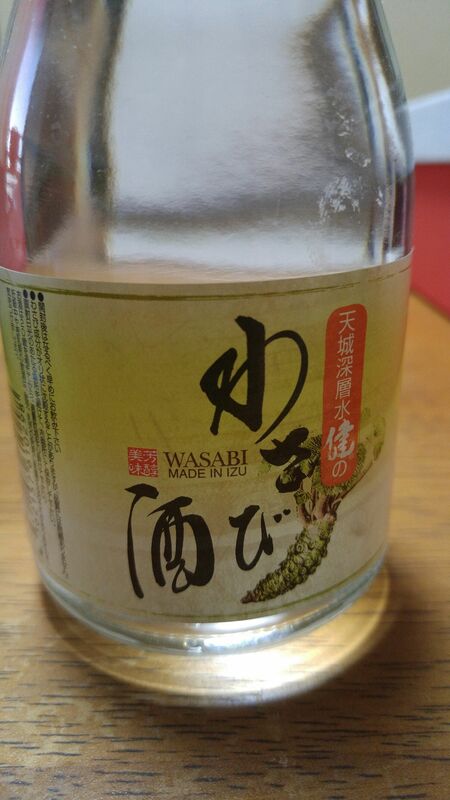 Shizuoka City, in Utogi for that matter, is the birthplace of wasabi. 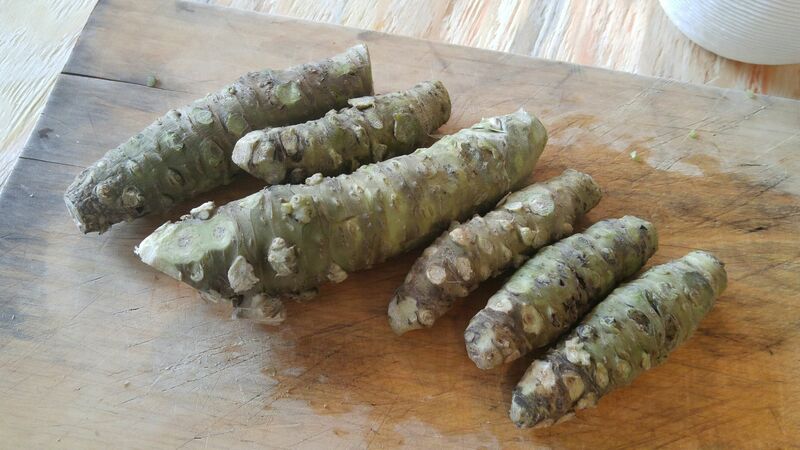 But the city itself is very large, the second largest city in Japan, area wise, and wasabi is grown in many other spots along the Abe River in particular. 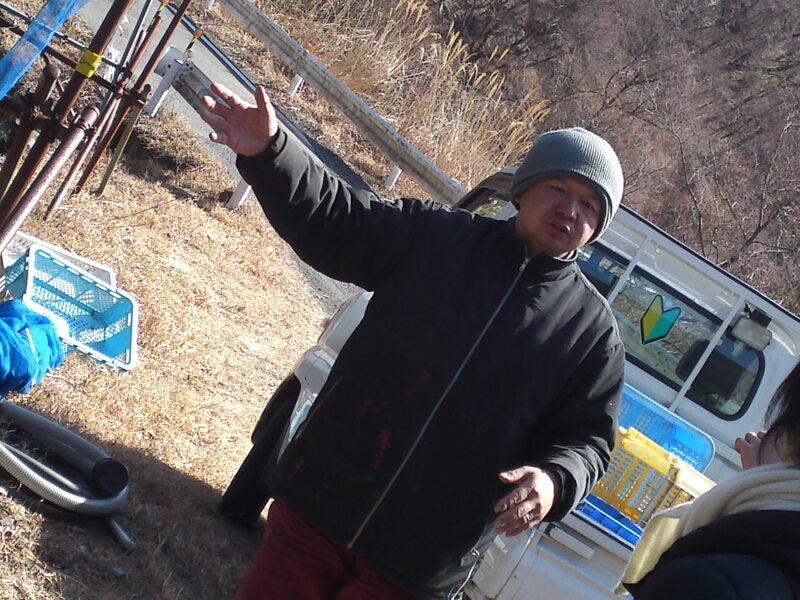 my chef friends and I had to drive a long way up as proved by the snow still clinging to the mountains in the background. 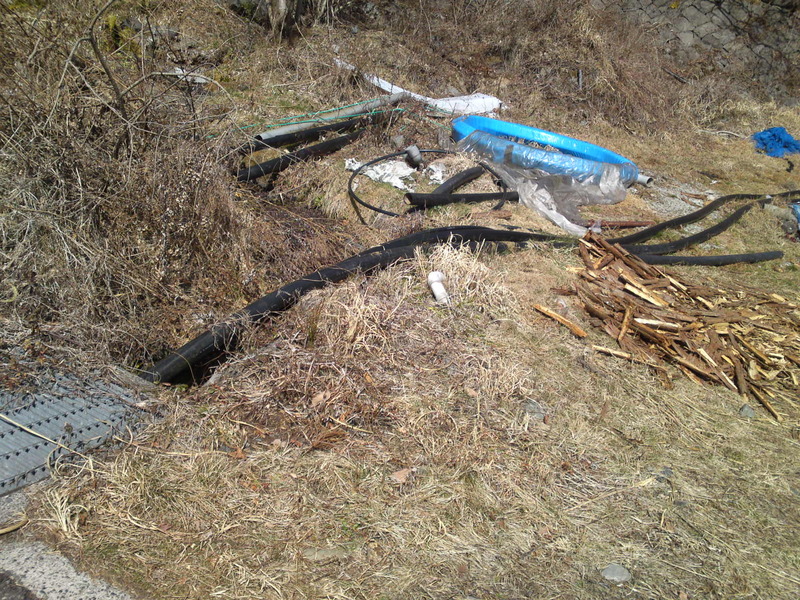 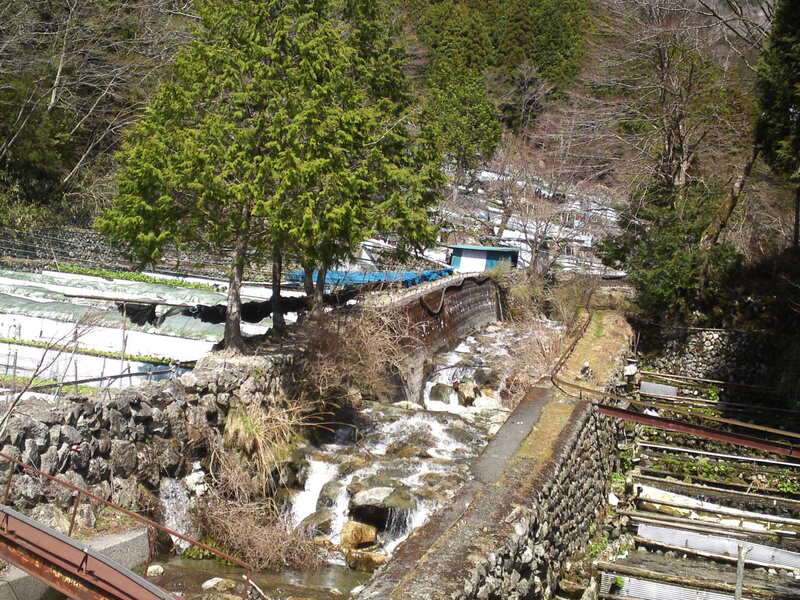 Actually these mountains are still part of Shizuoka City! 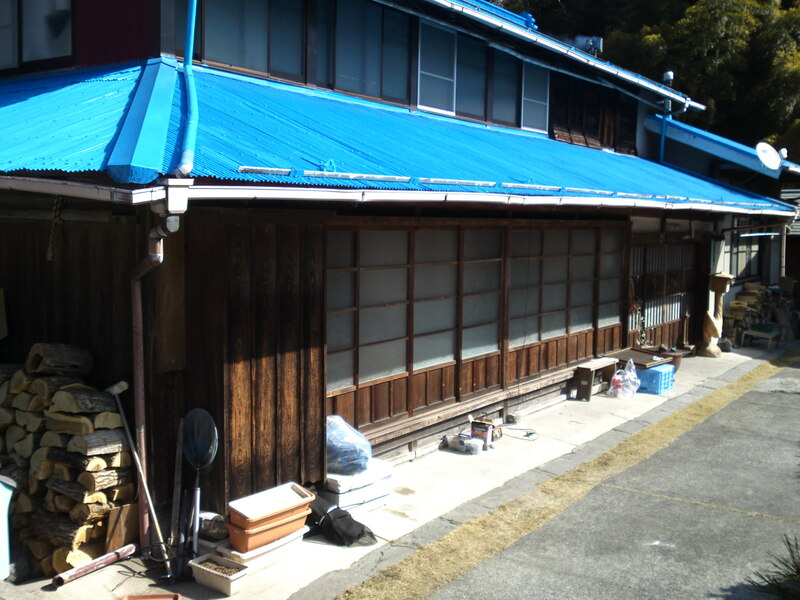 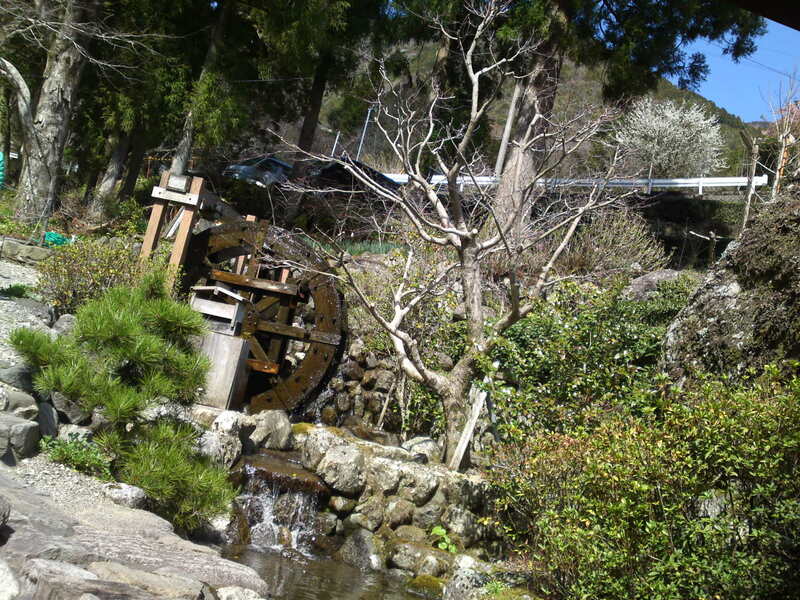 This is still much rural traditional Japan as typified by the Sugiyamas’family farmhouse! 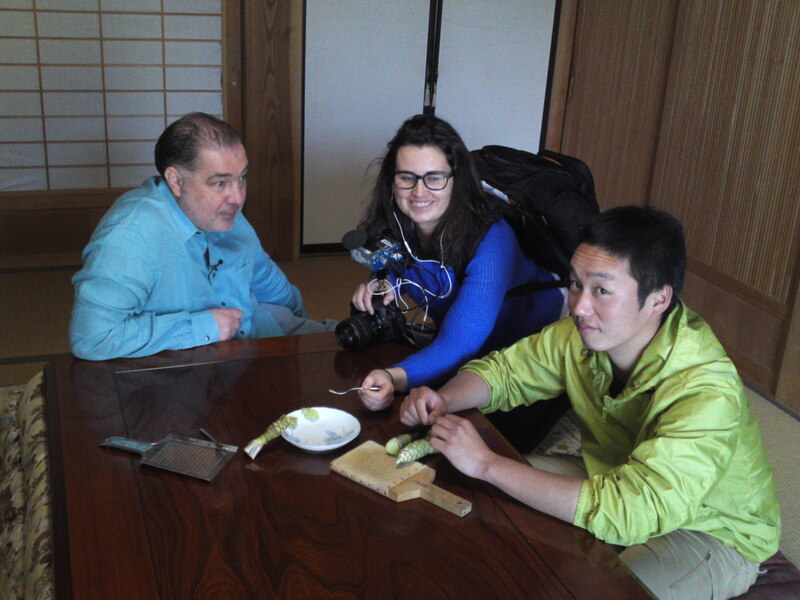 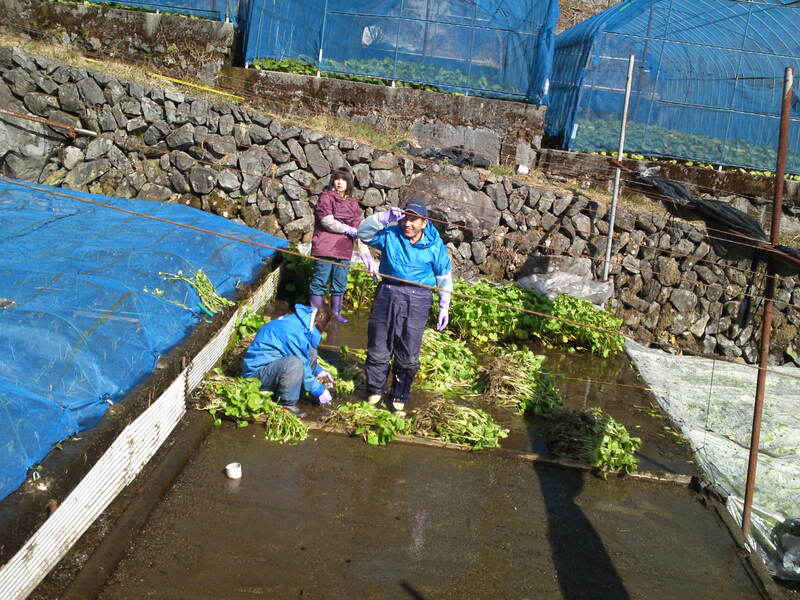 It still took us one more mire to meet Masahiro’s family busy harvesting wasabi in their fields at 600 meter-altitude! 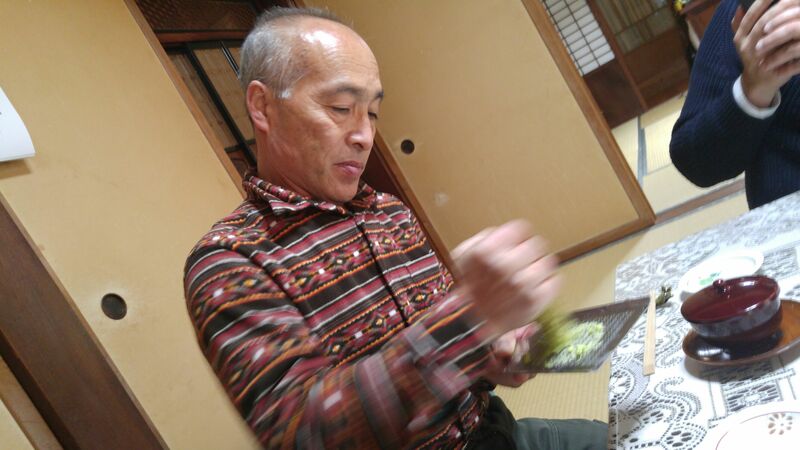 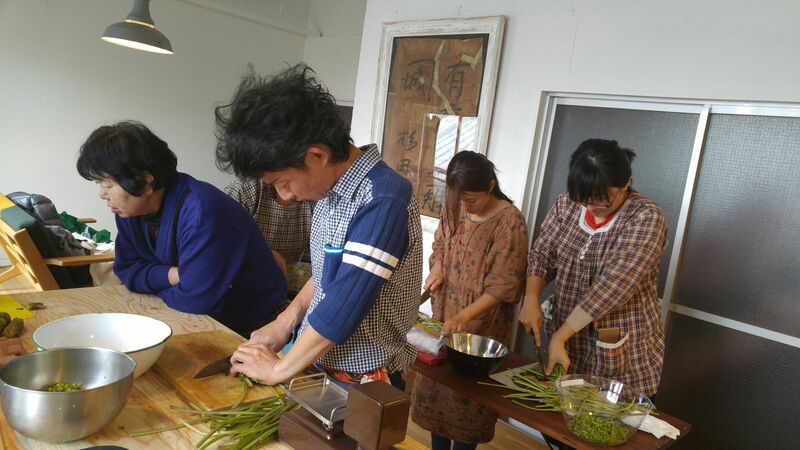 As Masahiro is the third generation as far as wasabi is concerned (he also grows tea, shiitake, konyaku roots and so on) you can see the second generation represented by his parents and the 4th generation in the person of his daughter still studying at Agricultural University in Hokkaido! 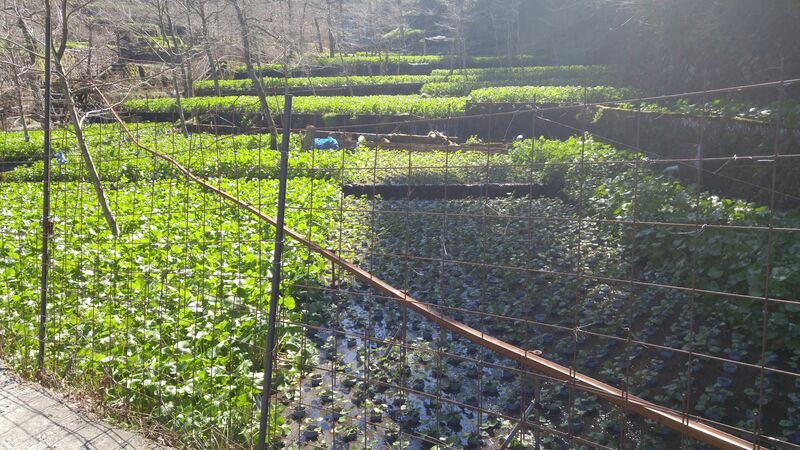 The wasabi fields which have to be protected from monkeys, wild boars, deer and other pests! 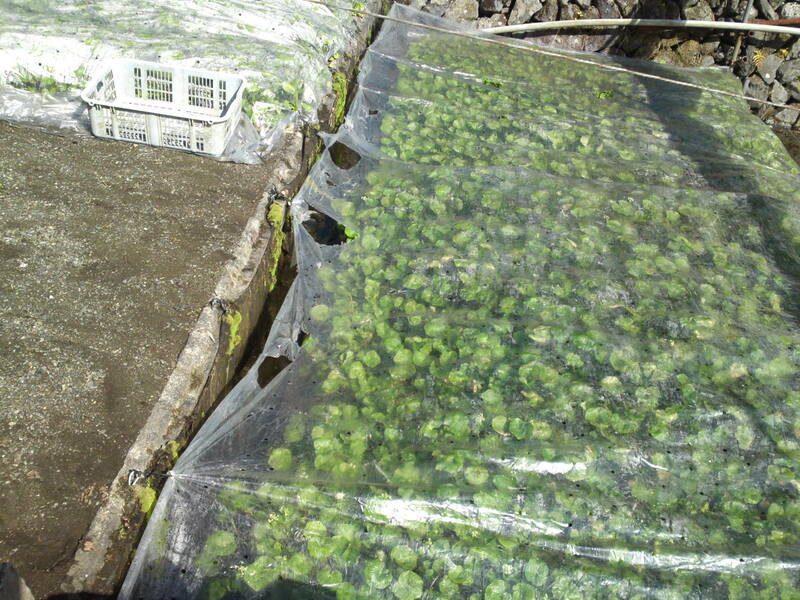 These wasabi which take about 12 to 18 months to grow from seedlings are almost ready for harvest which is conducted all year round. 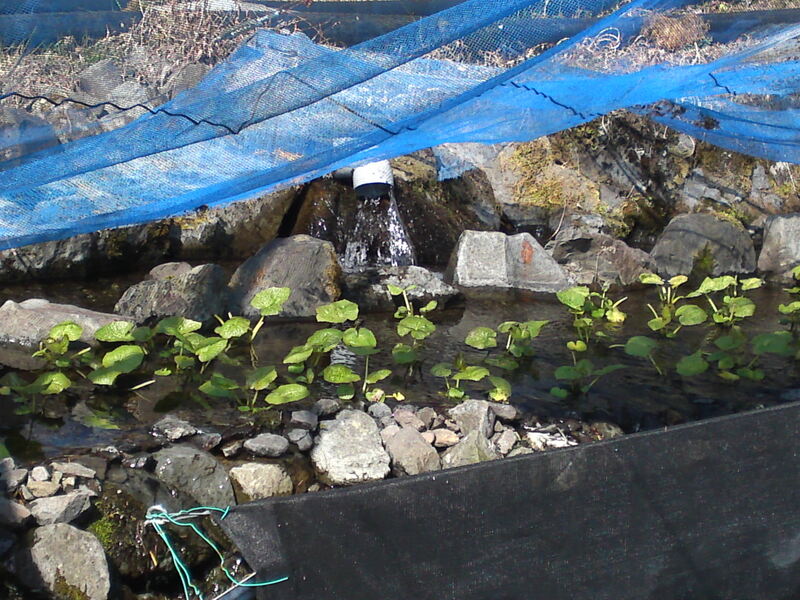 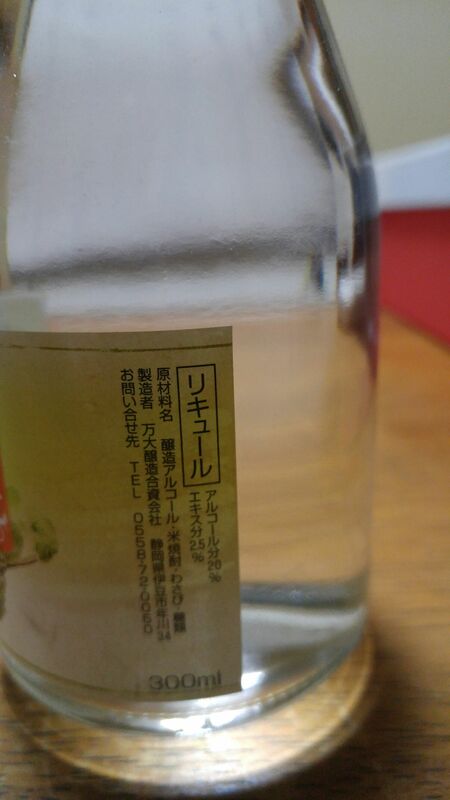 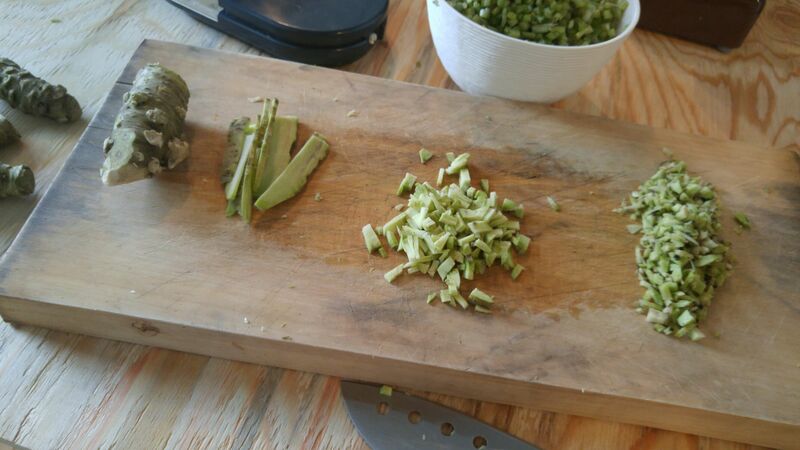 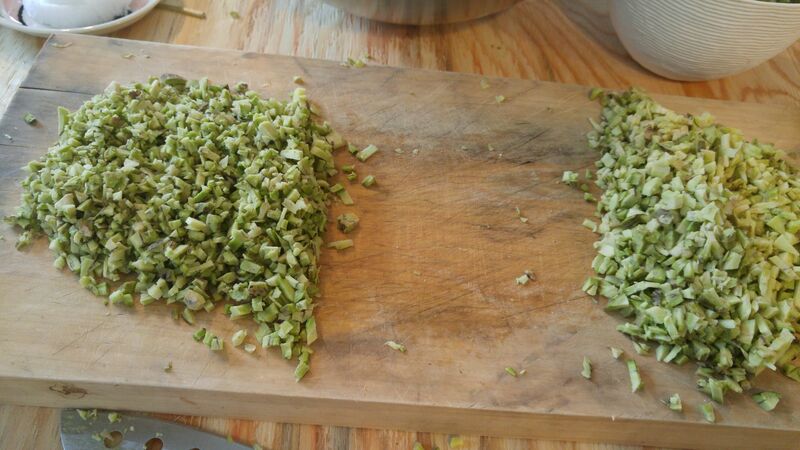 Wasabi culture is organic when sawa wasabi/fresh running water wasabi is concerned. 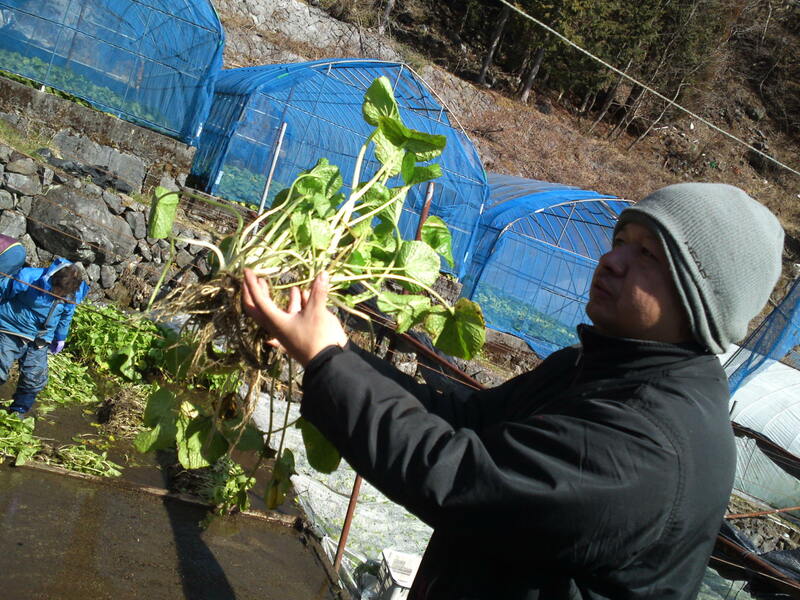 Masahiro, for better protection against disease and insects prefers to buy his seedlings from a nearby grower than to make his own seedlings. 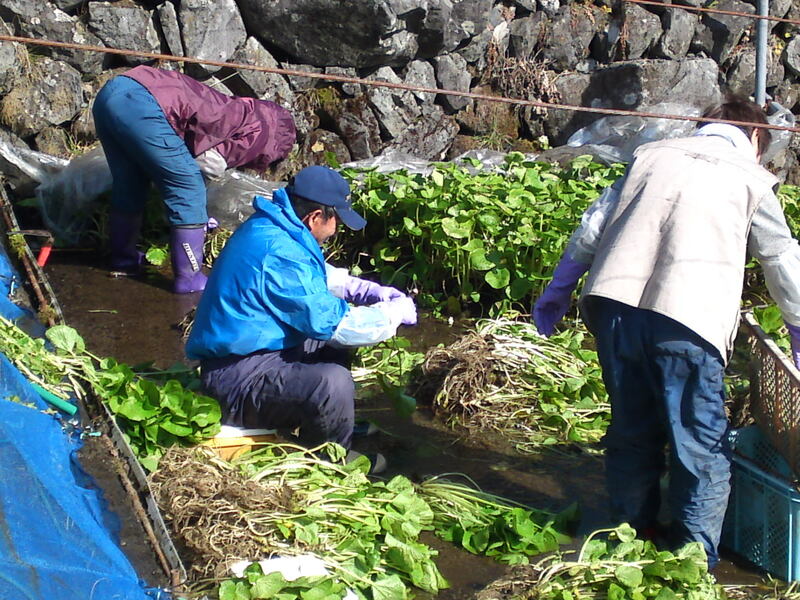 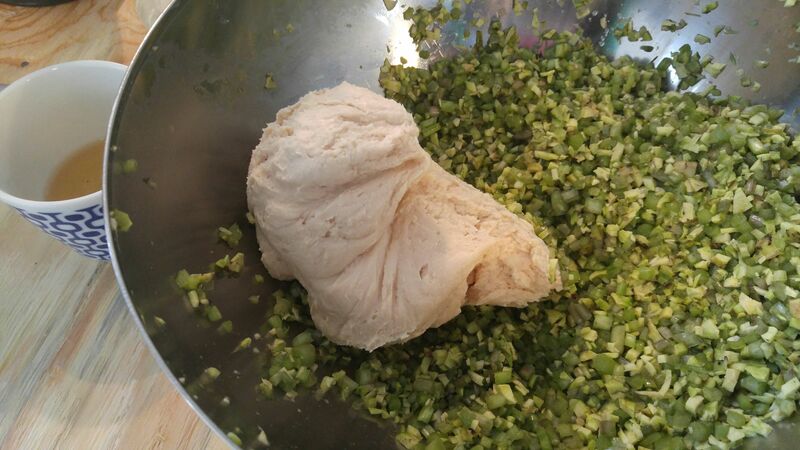 Uprooting and cleaning the fresh wasabi. 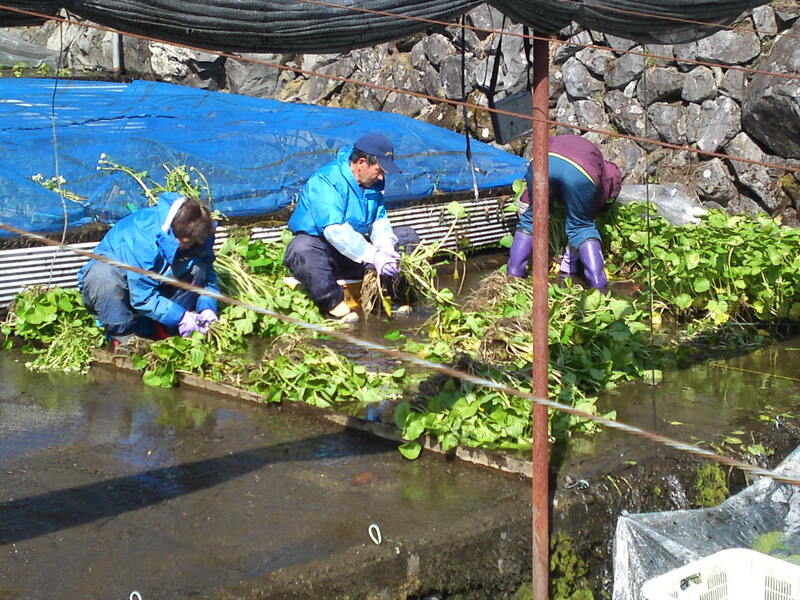 Wasabi culture is a tough job daily conducted whatever the temperature although the water has a constant temperature between 12 and 16 degrees all year round. 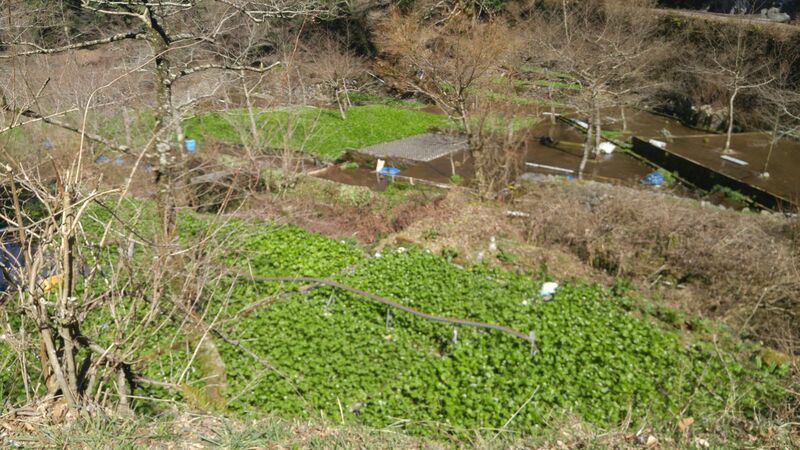 The wasabi fields water is directly pumped from the Abe River flowing along. 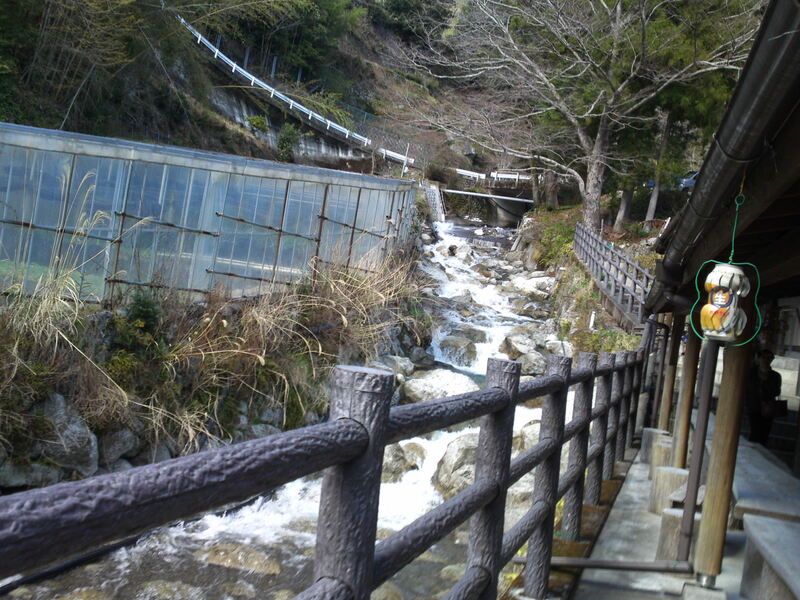 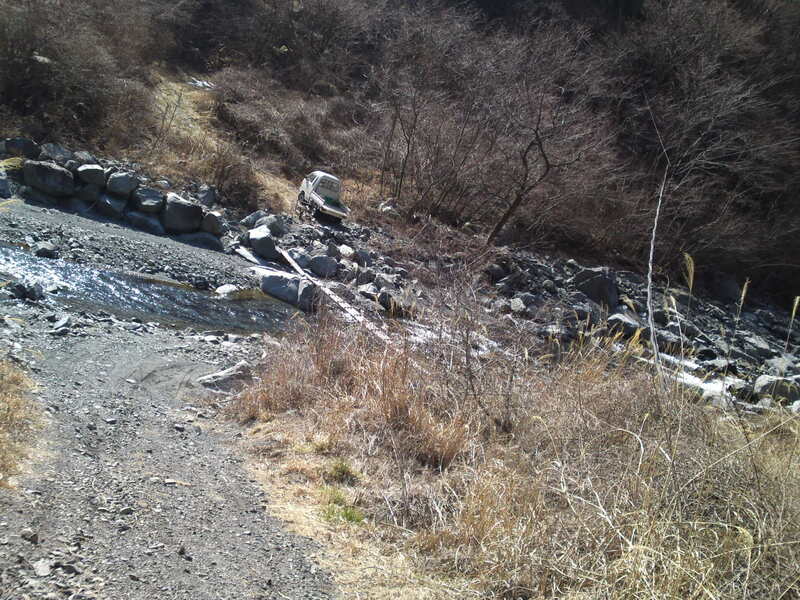 We are not far from the source of the Abe River and the water here is pure and untouched! 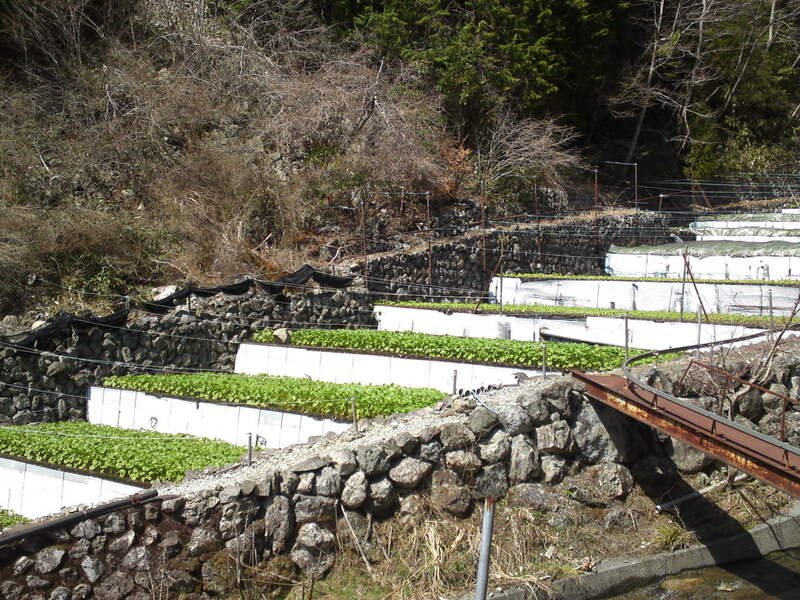 But for the wasabi fields this is wild country here! 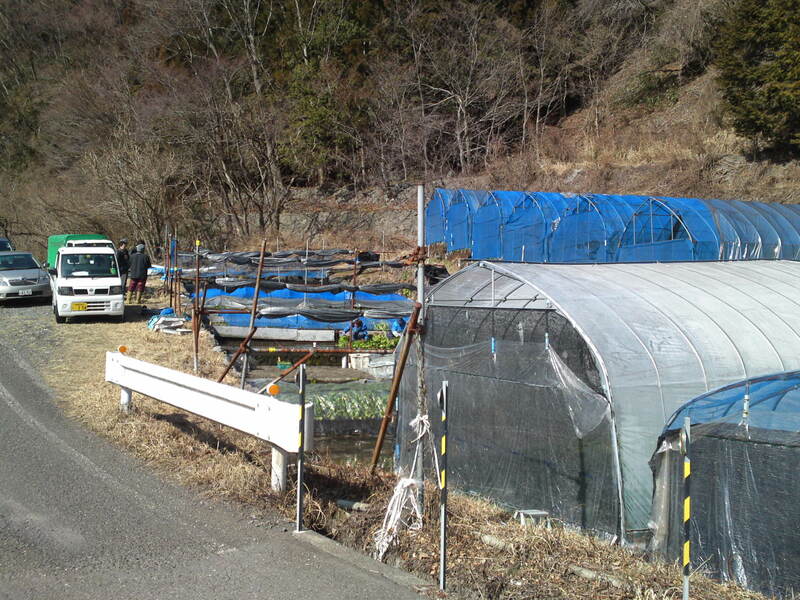 If it were not for the blue tents you wouldn’t know that agriculture is conducted there! 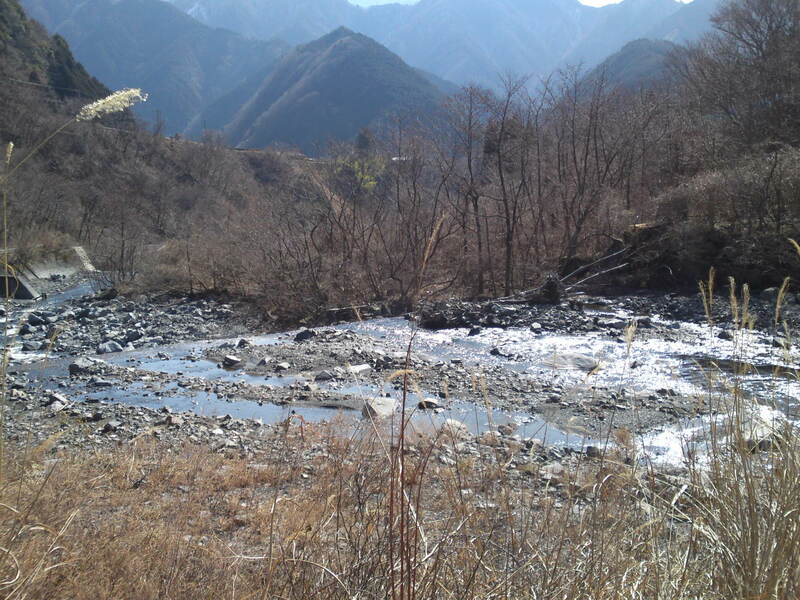 I can assure you that all protection is needed as we discovered whole groups of monkeys prowling nearby! 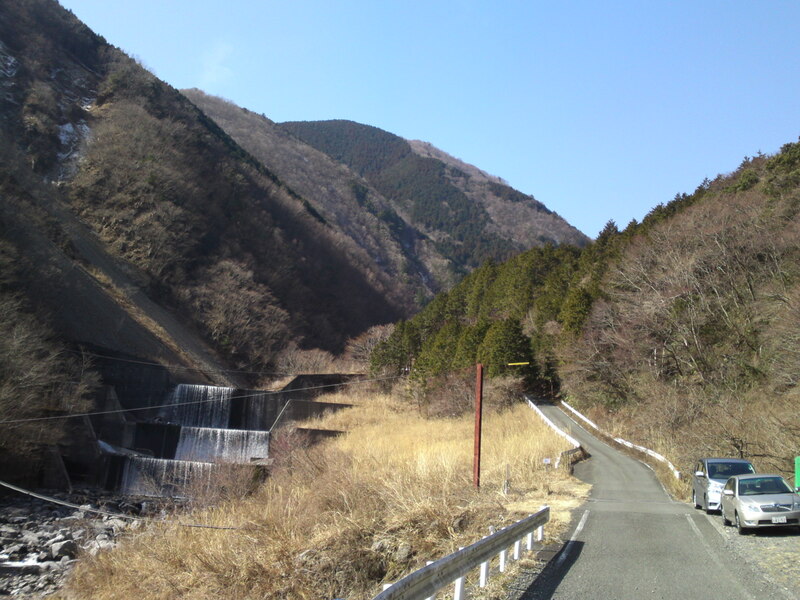 Only a single narrow road, recently paved, gives access! 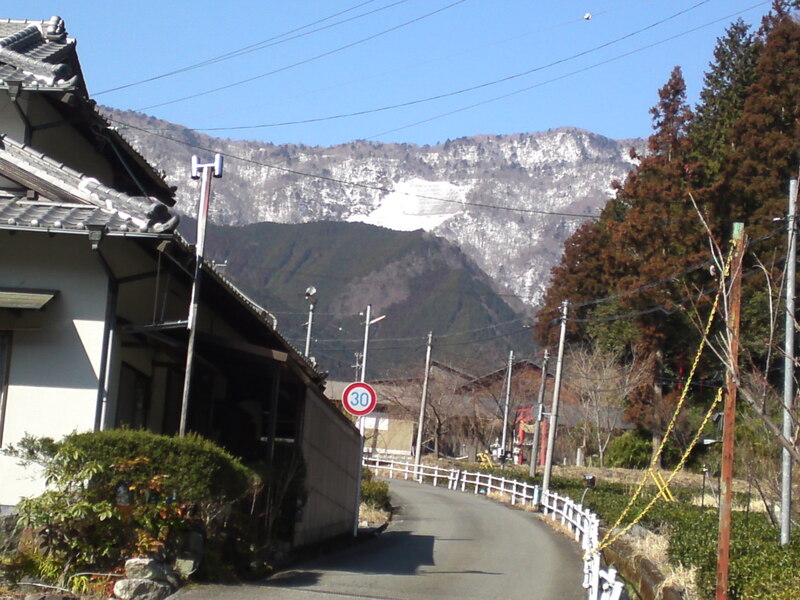 It is still winter up there! 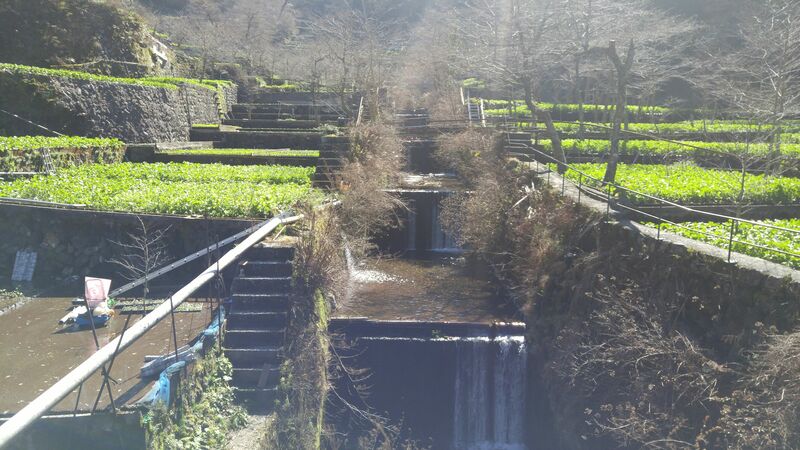 Those “steps/dams” were built a long time ago and they don’t interfere with the purity of the water. 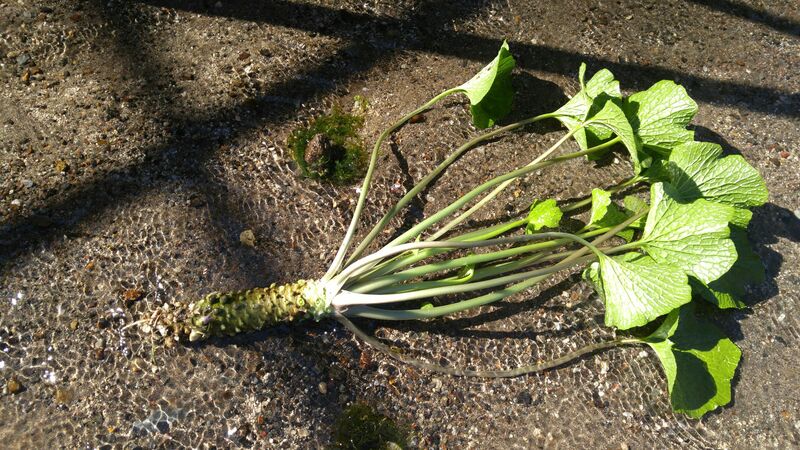 Not only the roots of these wasabi but also the leaves and stems are very popular with the local chefs who order directly from Masahiro Sugiyama according to their own specifications! 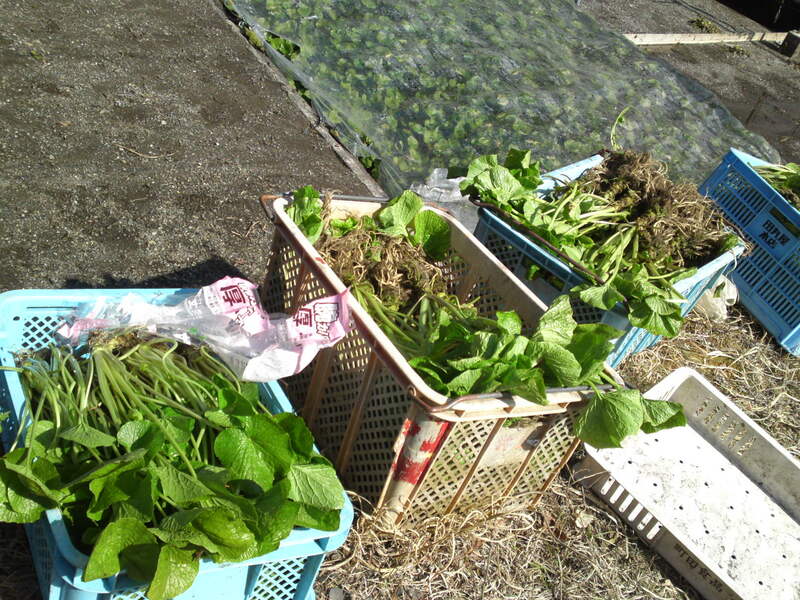 Another big crop of the precious vegetable! 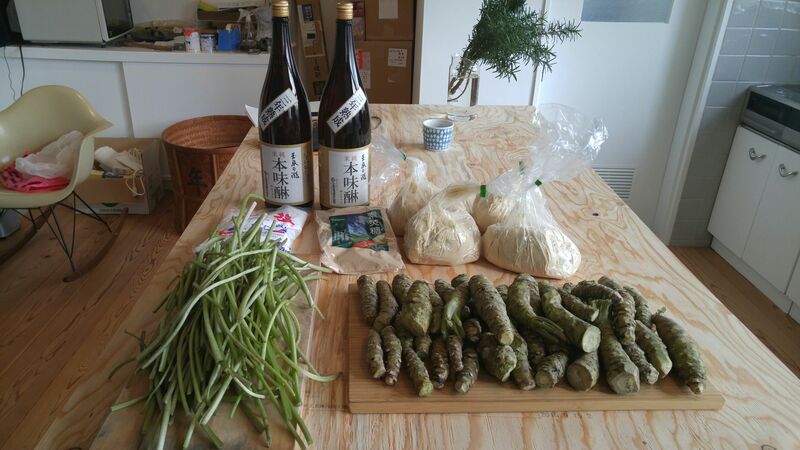 Ready to to the farmhouse! 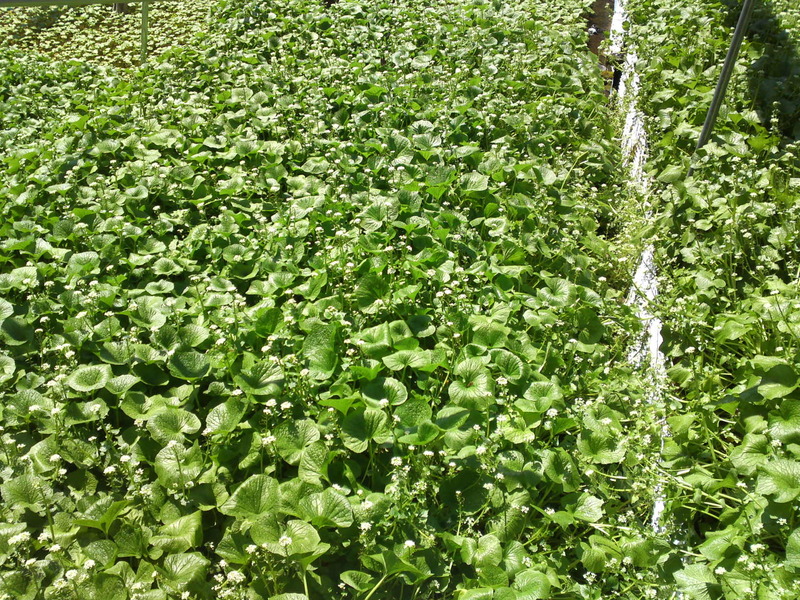 These will be cleaned and separated in roots, stems and leaves and even flowers which are all edible! 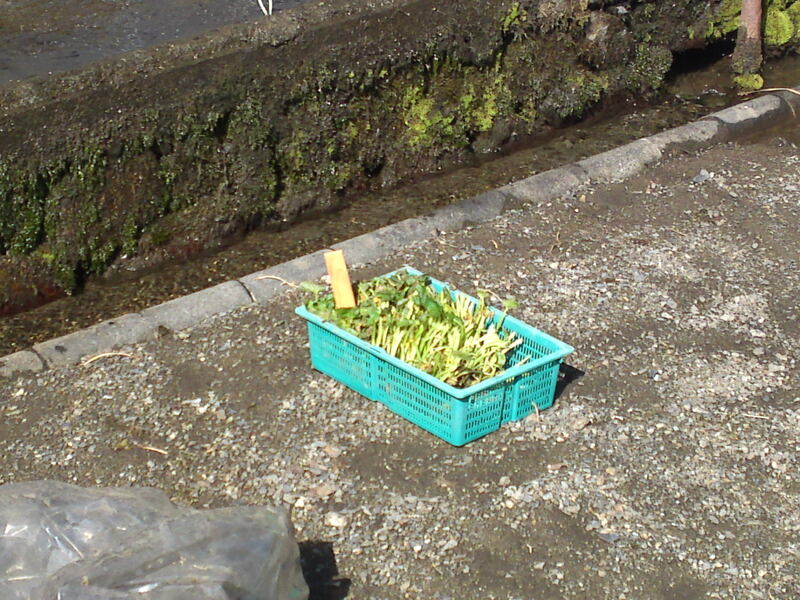 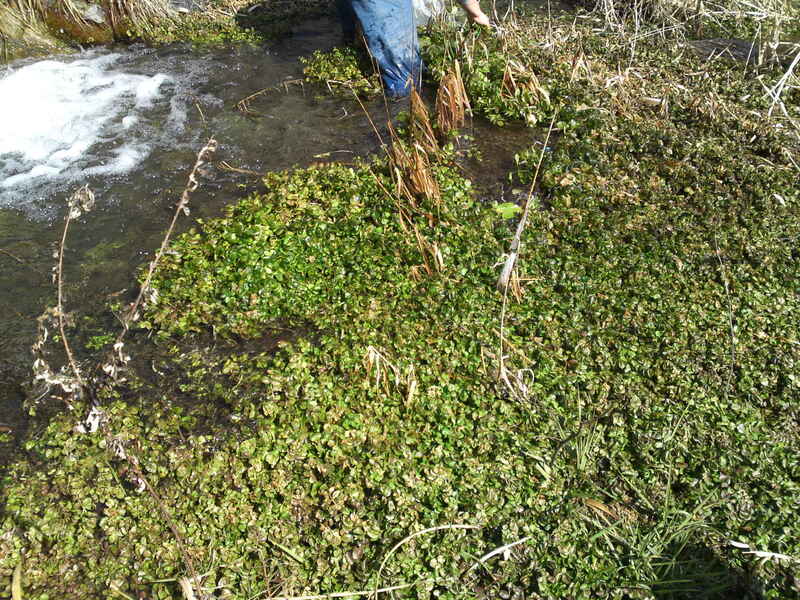 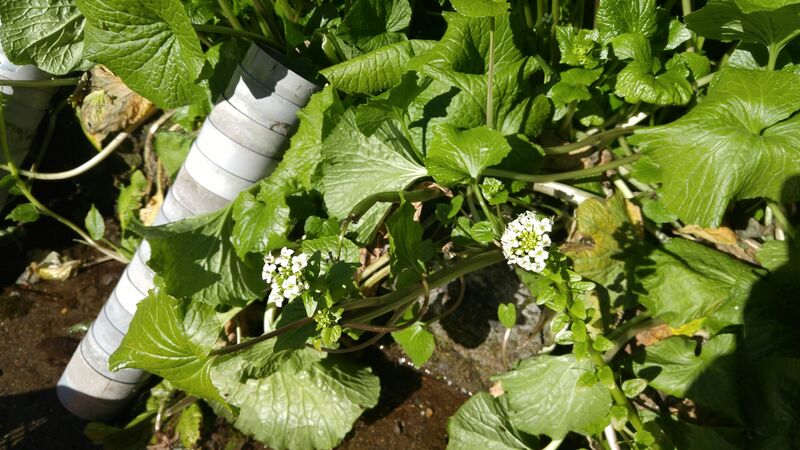 Now this was a great discovery: wild cress growing in the same water! 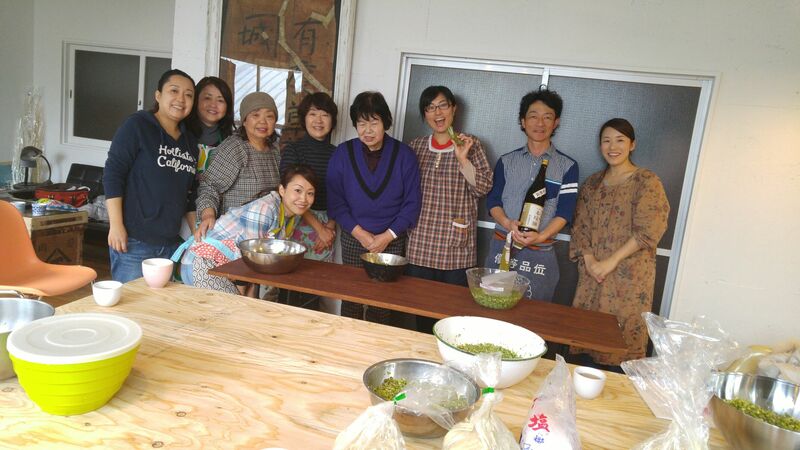 We all took batches back home! 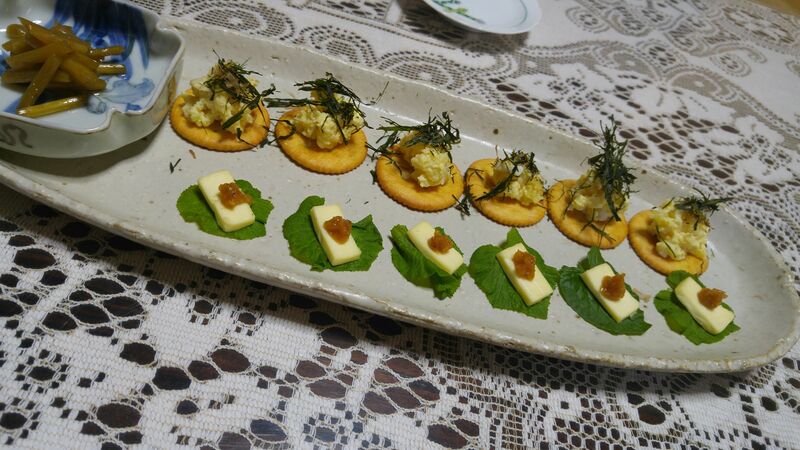 So sweet and crunchy! 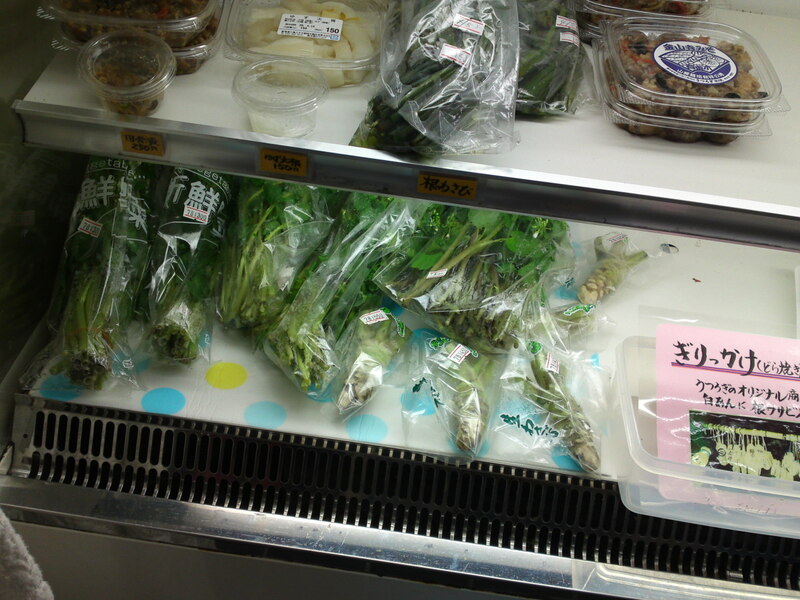 You will find such at supermarkets! 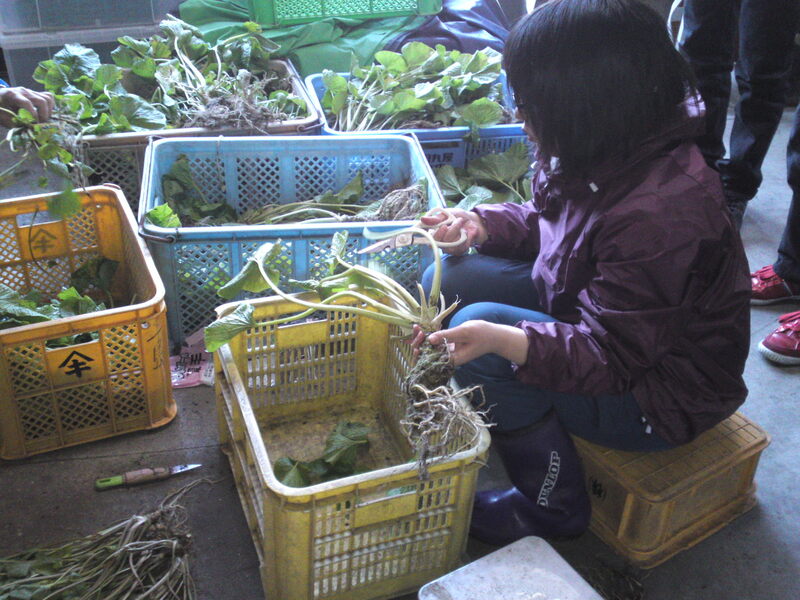 More hard work back at the farm where all the roots, stems, leaves and flowers have to be separated, cleaned and packed for immediate delivery! 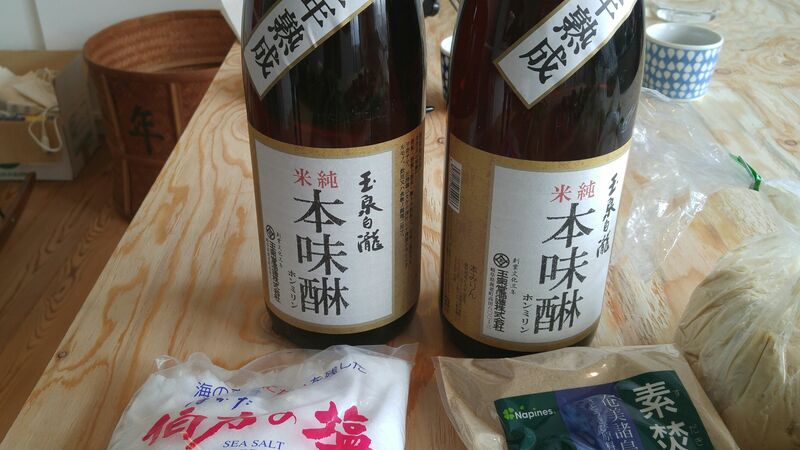 No wonder these beauties fetch such a price (mind you, they are comparatively cheap here!)! 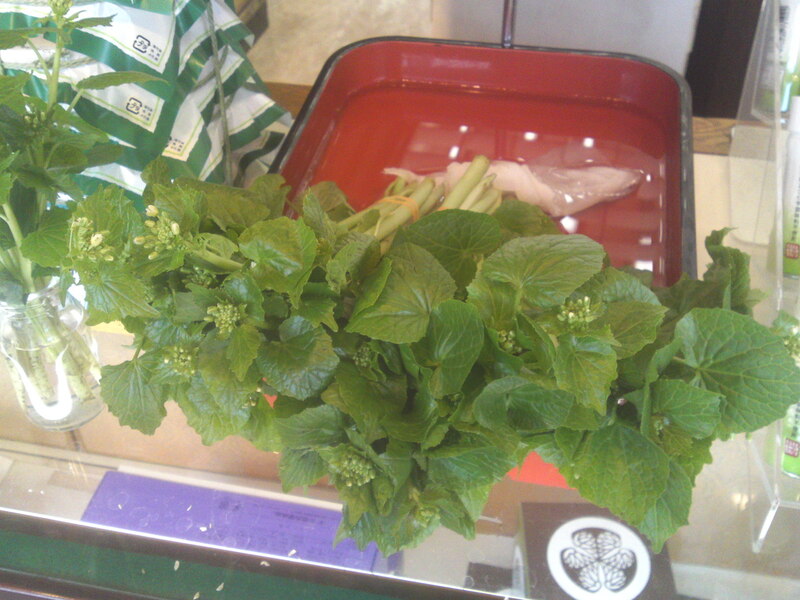 Wasabi Flowers at Tamaruya in Shizuoka City! 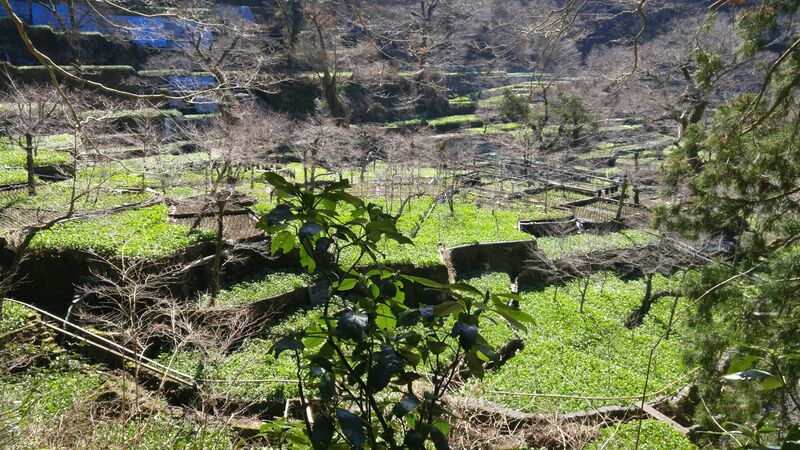 We know spring is around the corner in Shizuoka Prefecture and especially in Shizuoka City because the wasabi flowers are at last on sale! 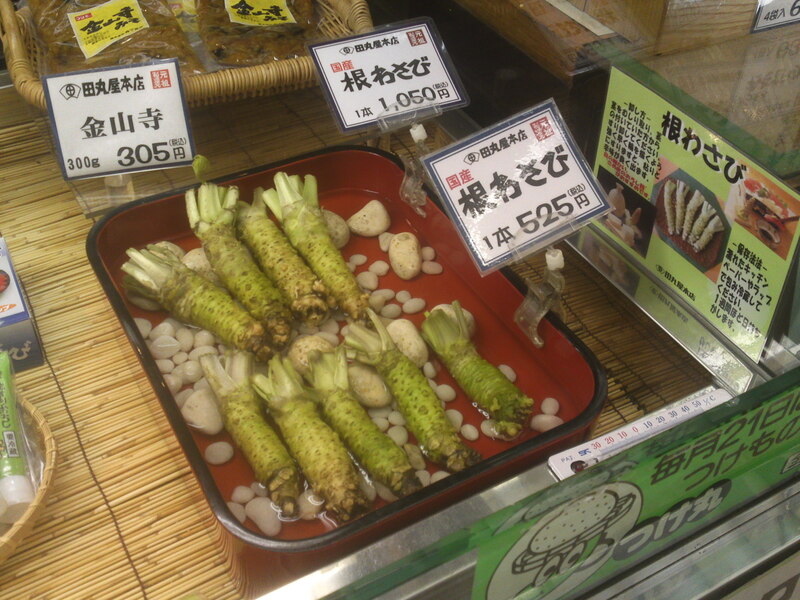 It is certainly not easy to obtain them so fresh and cheaply as Shizuoka Prefecture produces 80% of all wasabi in Japan! 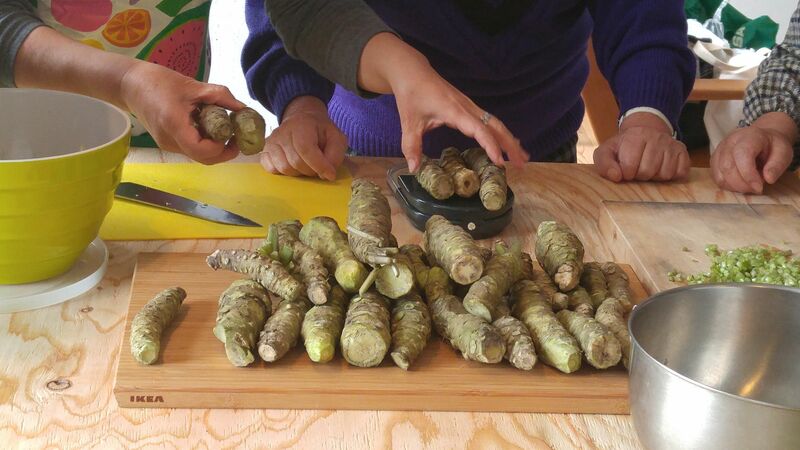 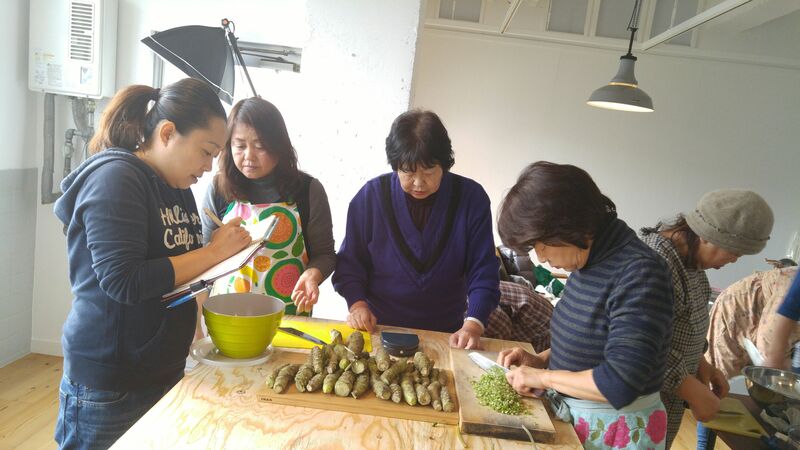 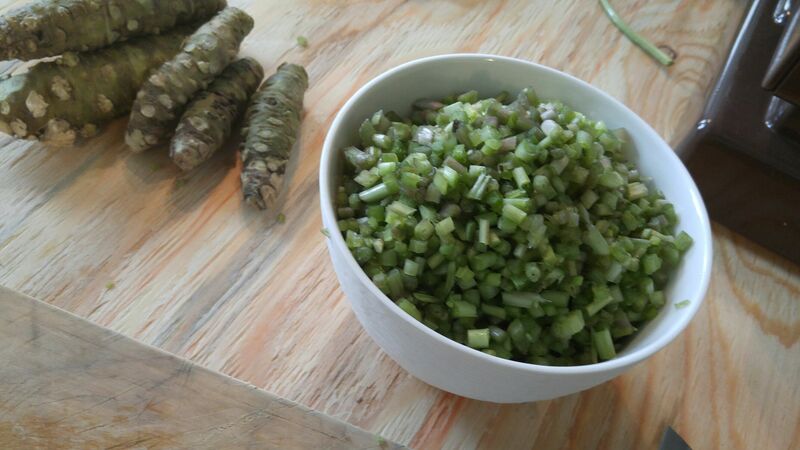 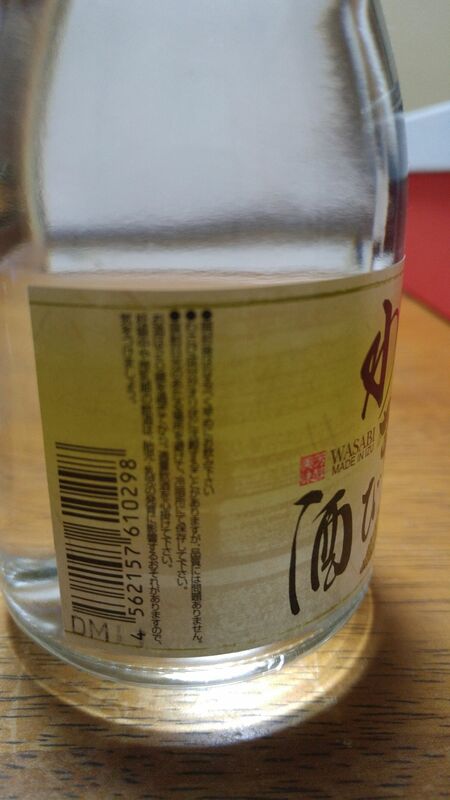 Tamaruya Company is the oldest company trading wasabi, fresh or processed, in the whole World as it was established in Shizuoka City in the 17th Century when it was first grown by humans in Utogi/有東木 along the Abe River/安部川 in present Shizuoka City! 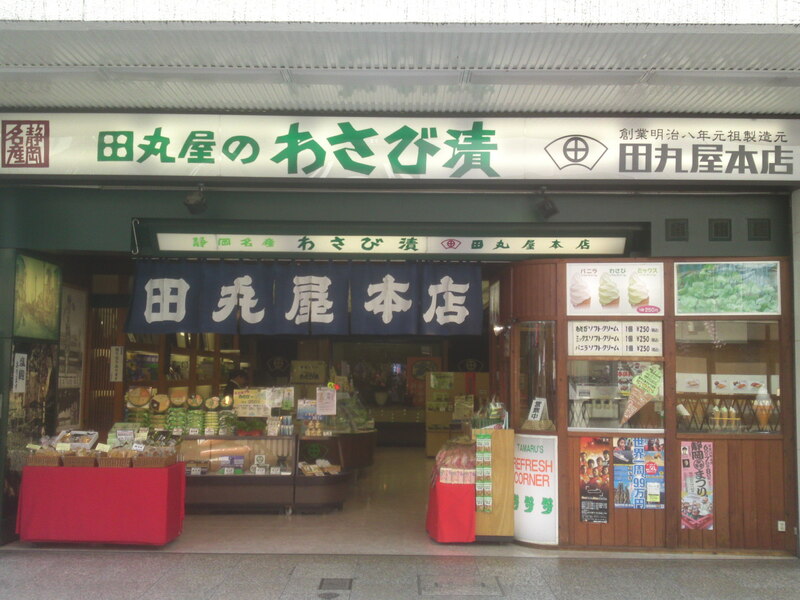 Their present shop has stood in front of Shizuoka Station (February 1st, 1889/21st Year of Meiji Era) site since 1876 (8th Year of Meiji Era)! 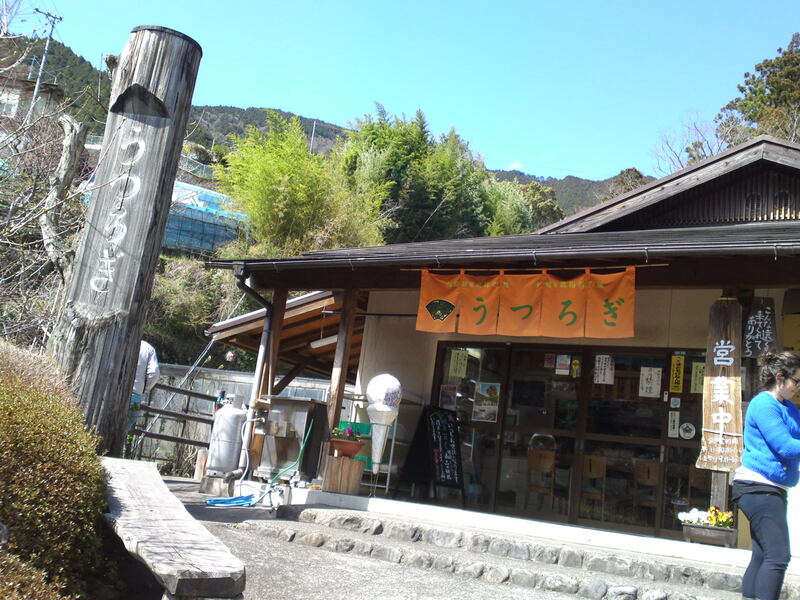 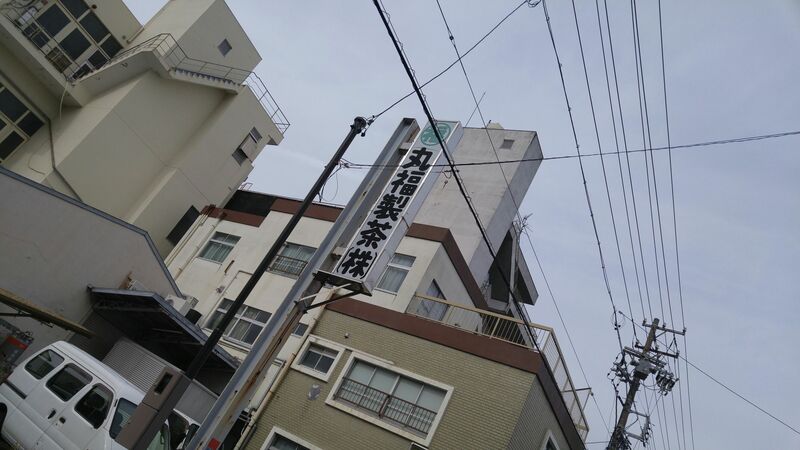 Their oldest shop is a must-visit for all tourists, be they Japanese or foreigners, coming to Shizuoka City as it is only 5 minutes on foot away from Shizuoka City JR Station! 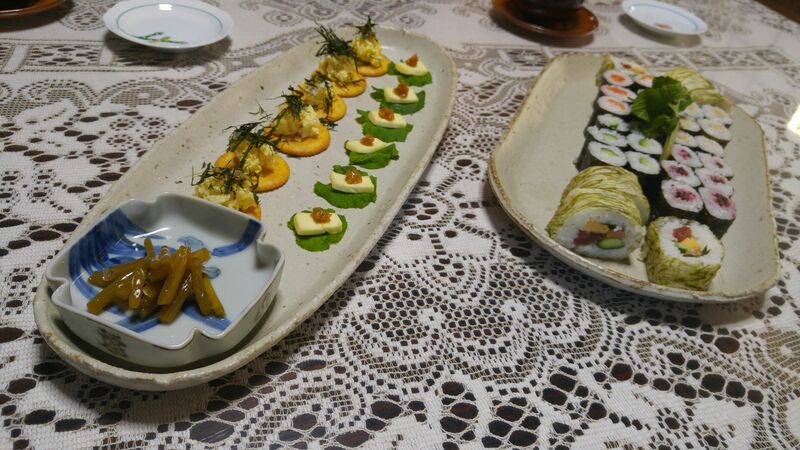 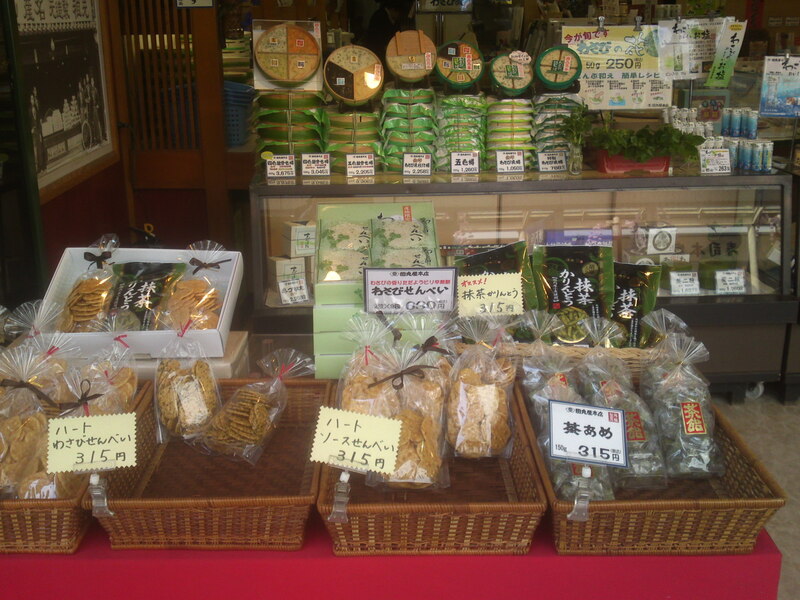 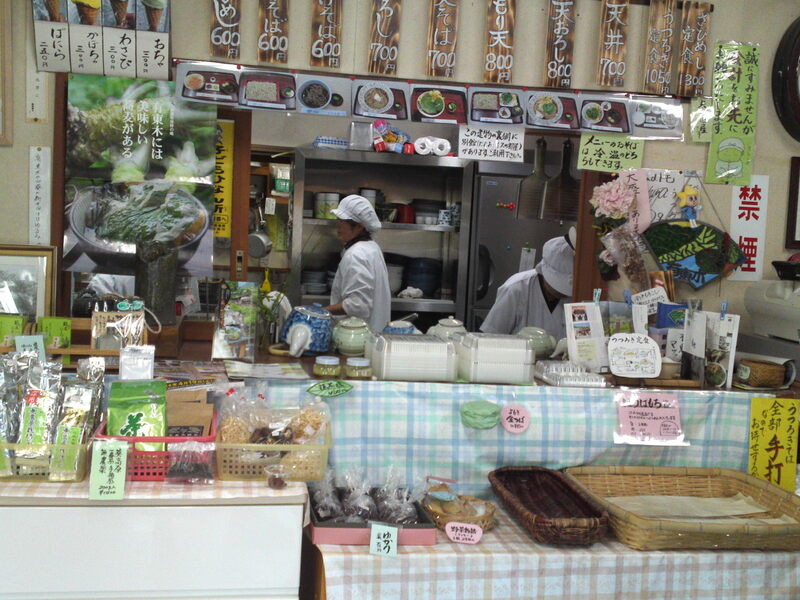 Not only they sell fresh wasabi roots and flowers, but also a vast array of processed products including wasabi paste, salt, dressings, pickles and many many more! 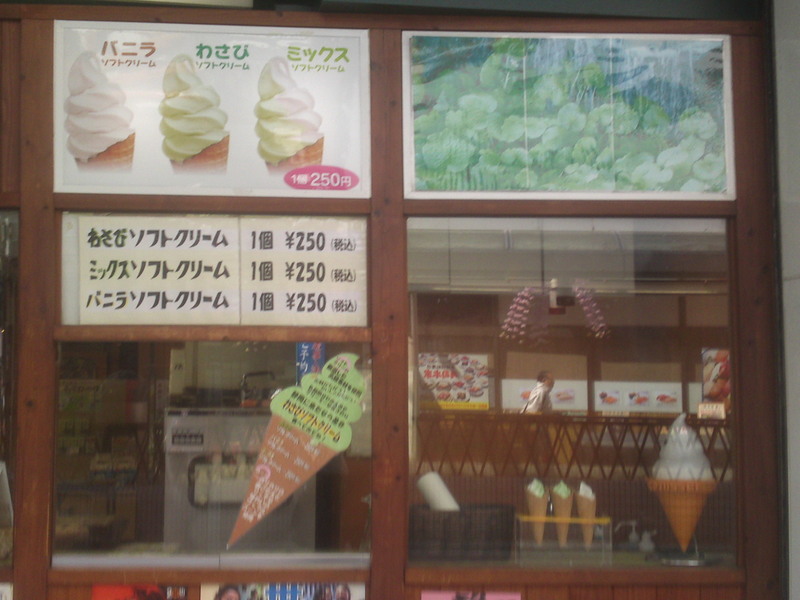 You must try their wasabi soft ice-creams, especially in the summer! 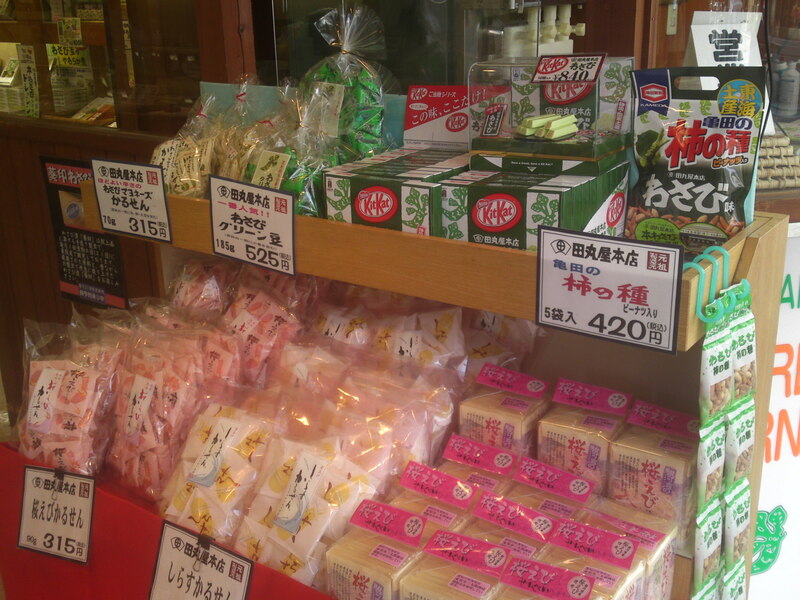 I know a lot of people who buy their snacks for a trip or back home, especially Wasabi Kit Kat chocolates and wasabi sakura ebi crackers! 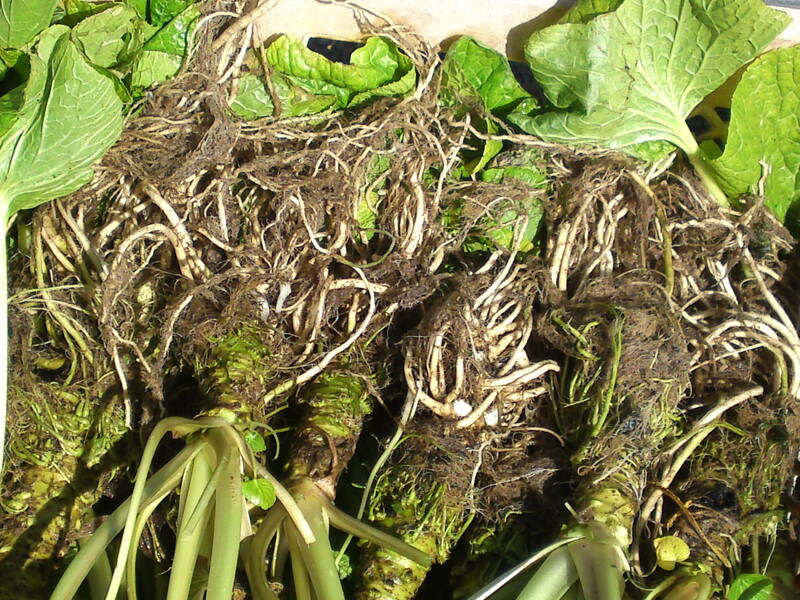 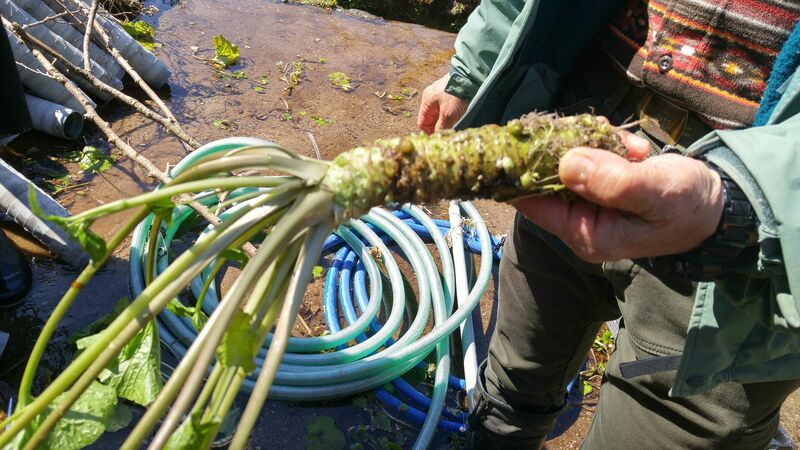 Naturally you can have a good look at and buy fresh wasabi roots! 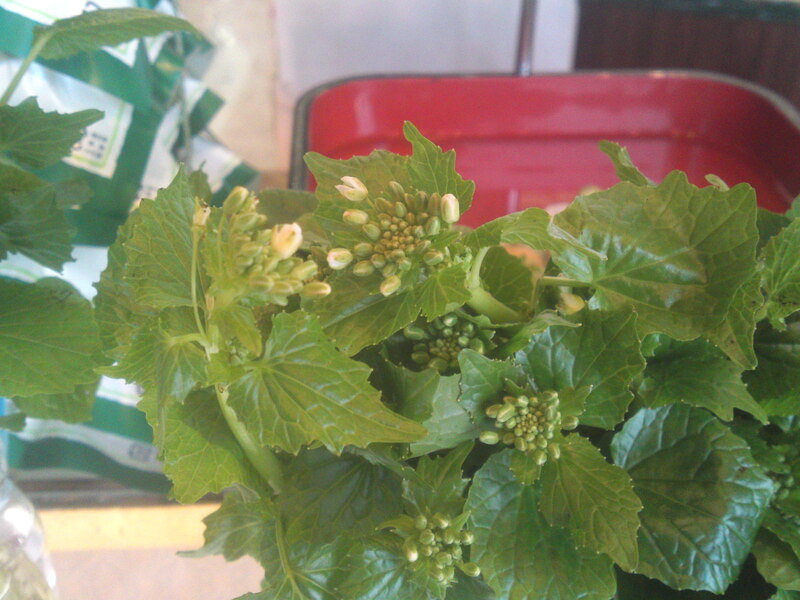 And of course their fresh wasabi flowers with their small leaves and stems! 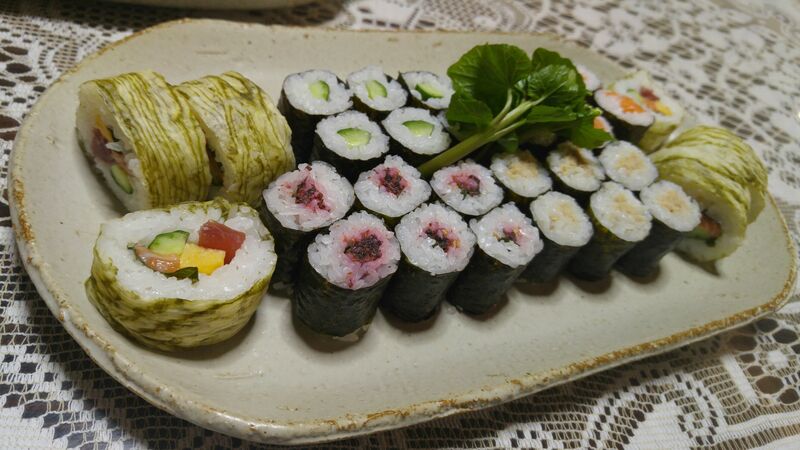 Now, how do we eat them, you are going to ask me? 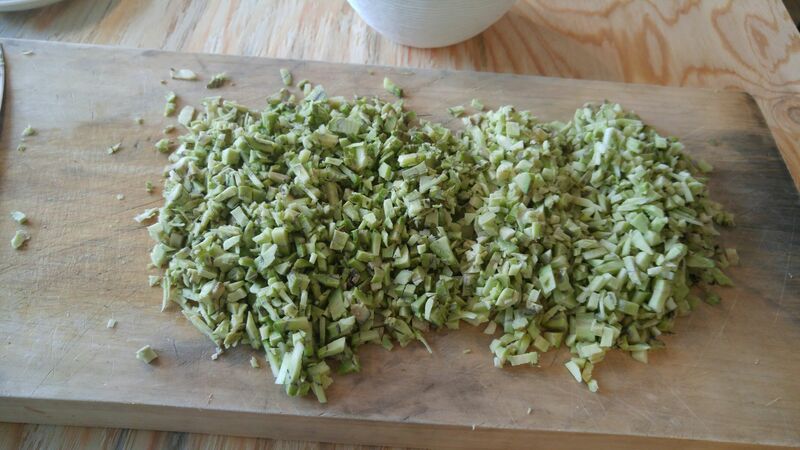 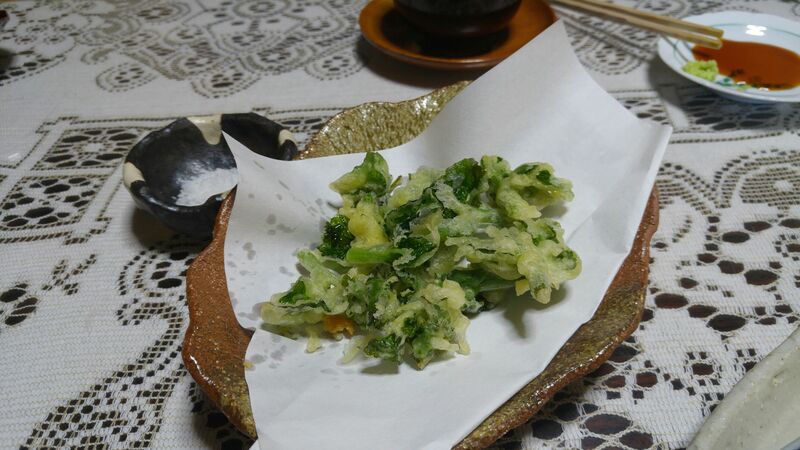 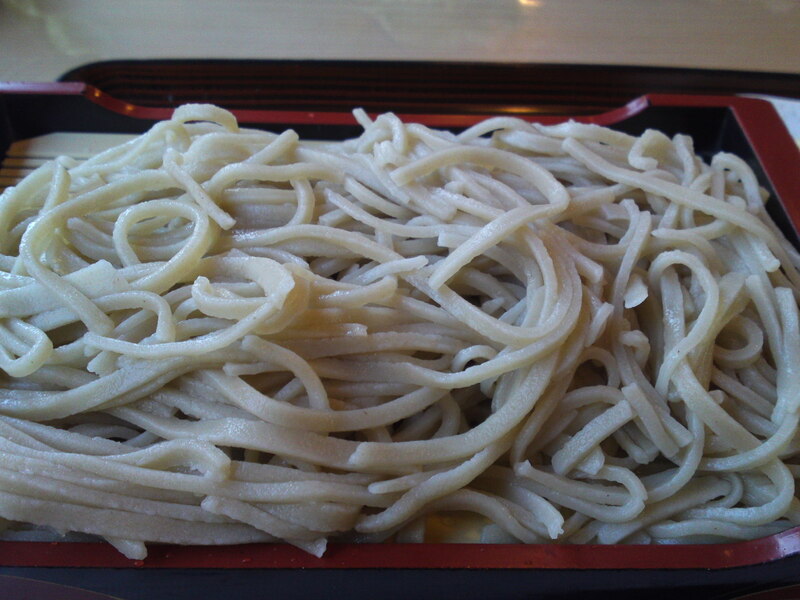 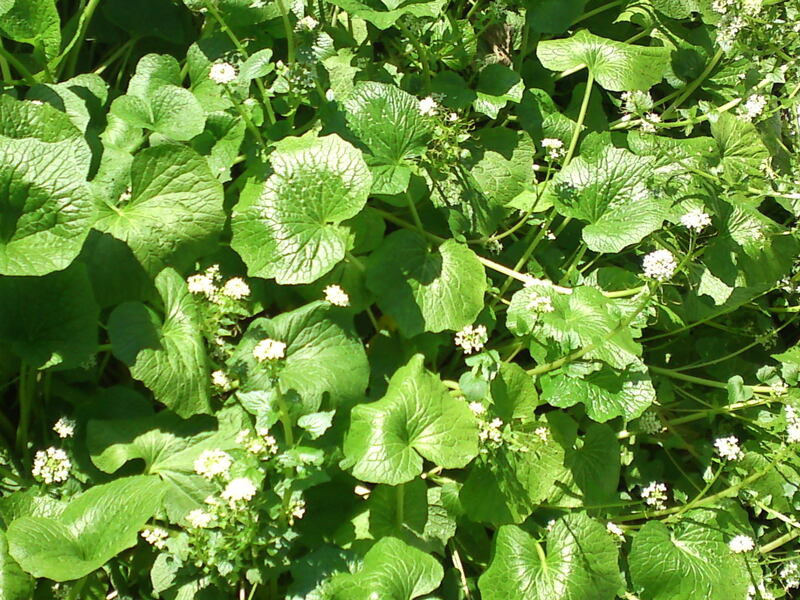 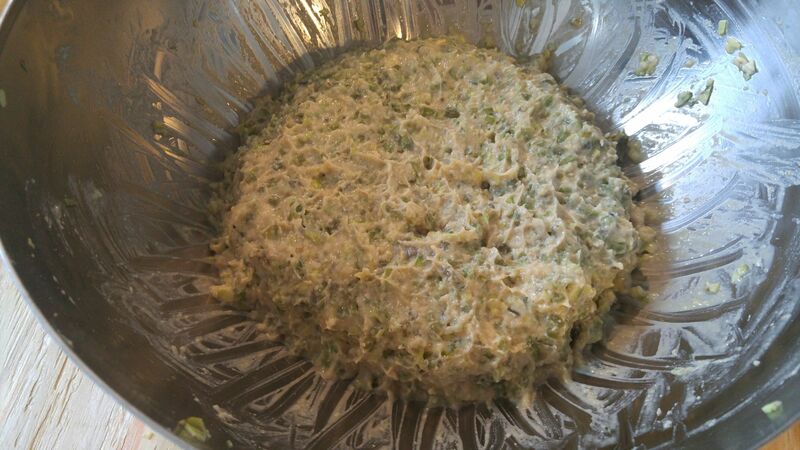 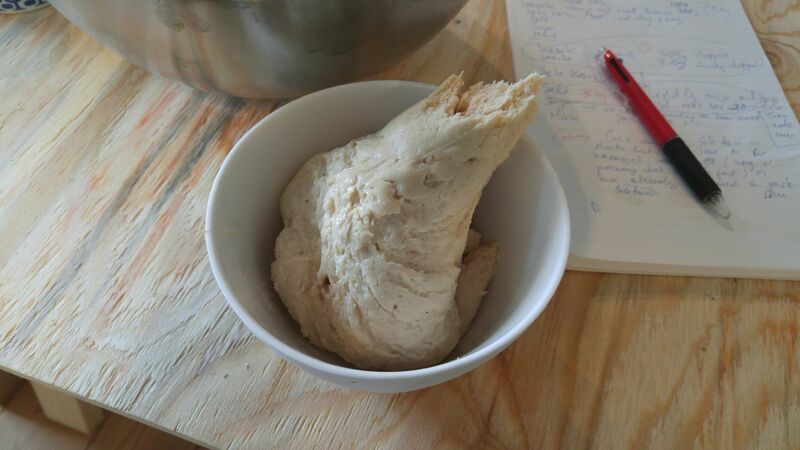 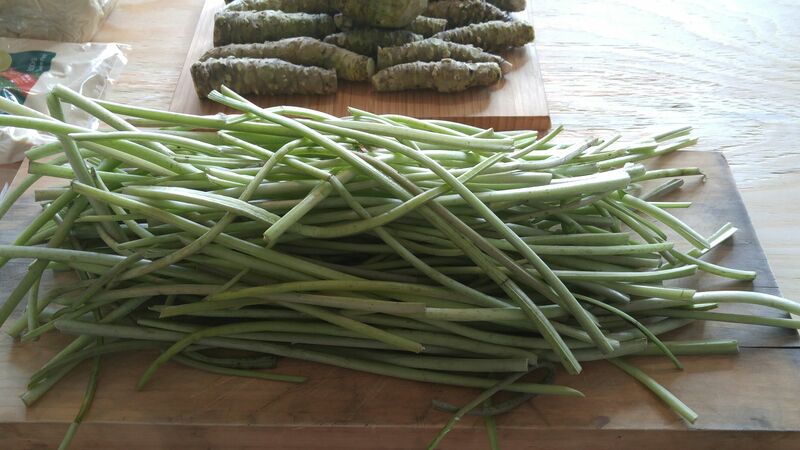 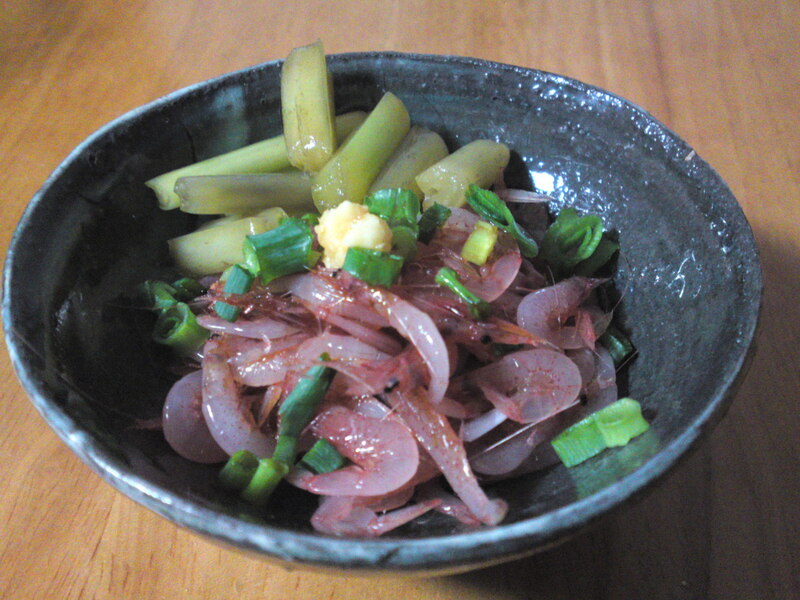 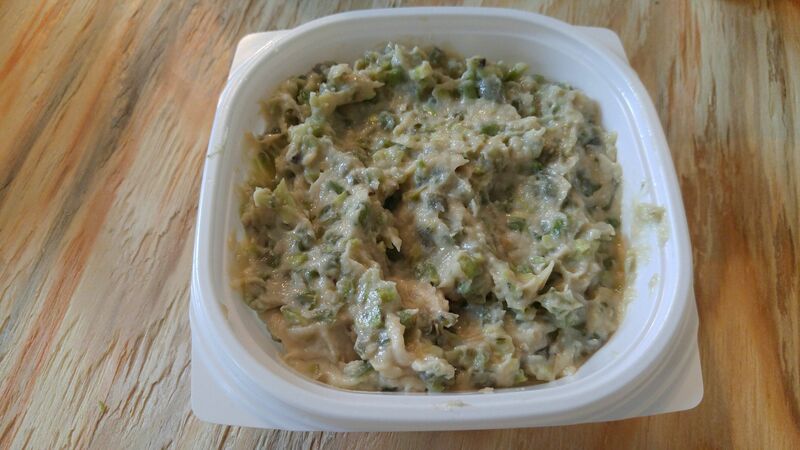 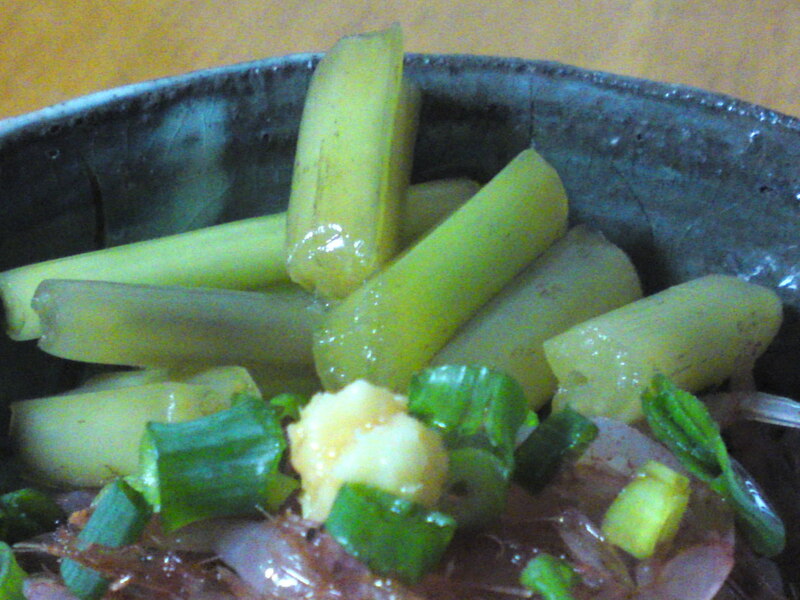 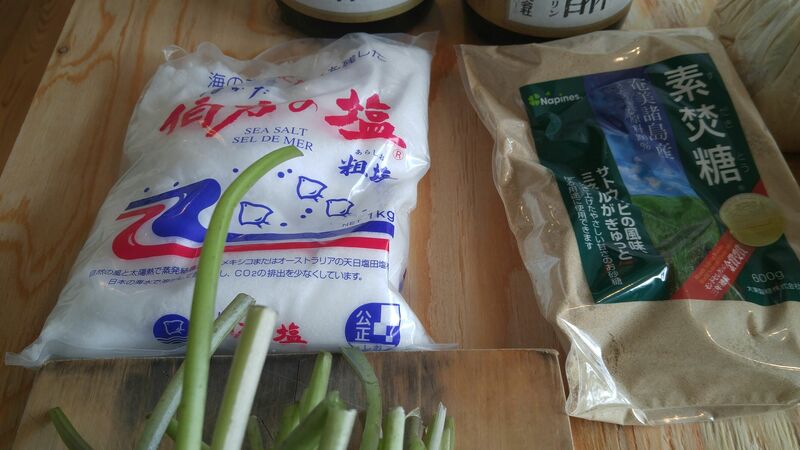 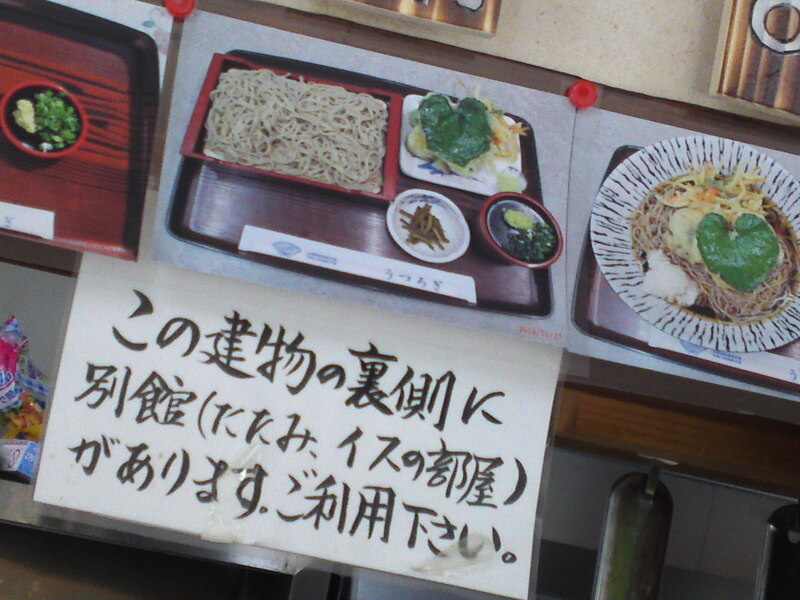 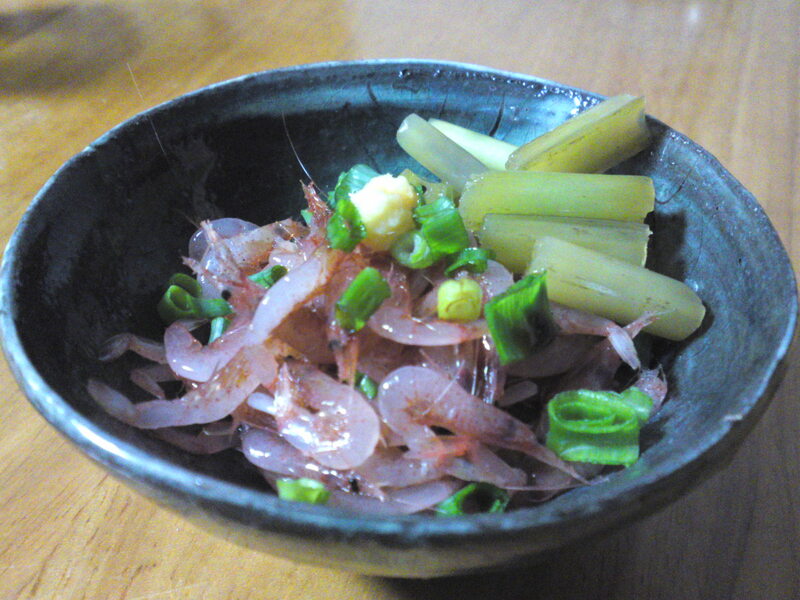 The leaves and flowers can be eaten raw in salads, with soy sauce, mayonnaise or miso paste. 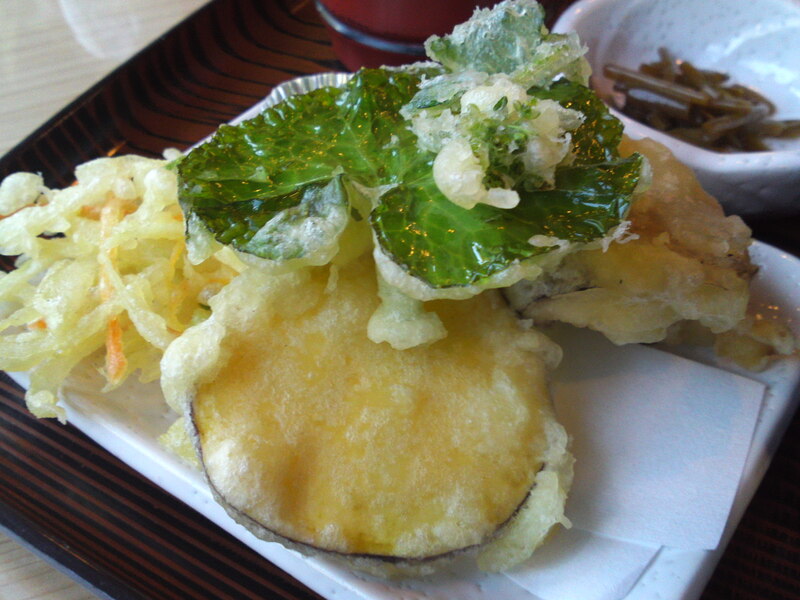 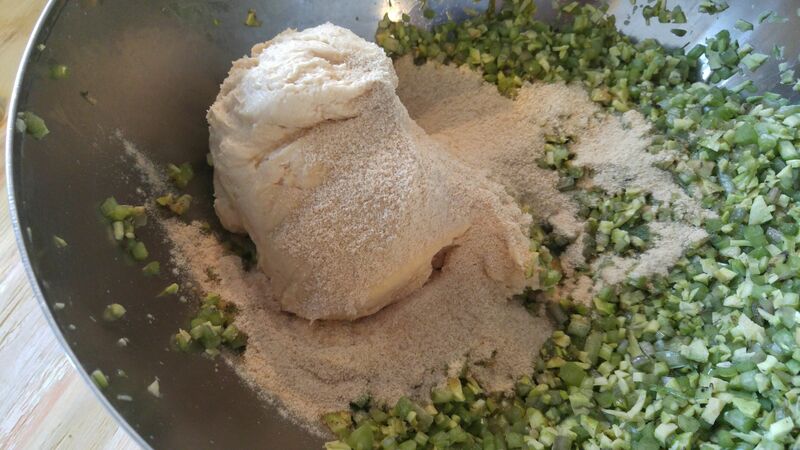 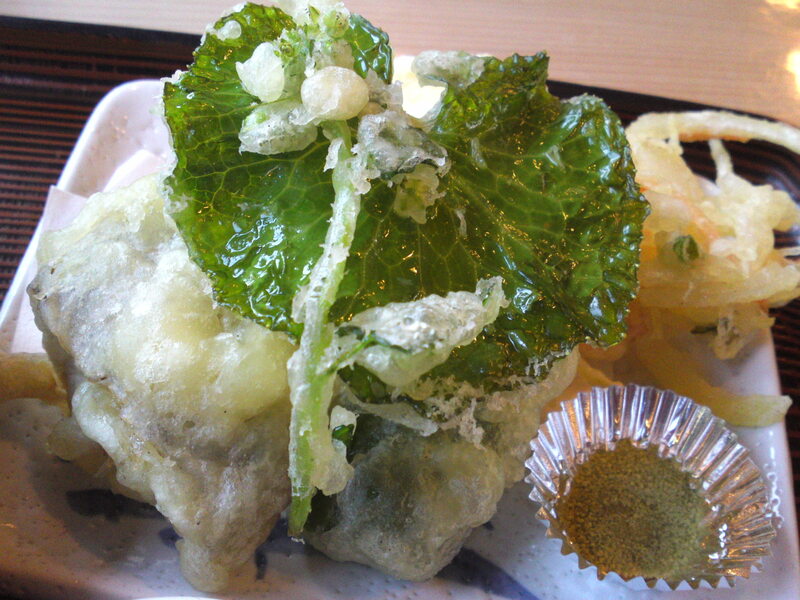 They can also be prepared as tempura! 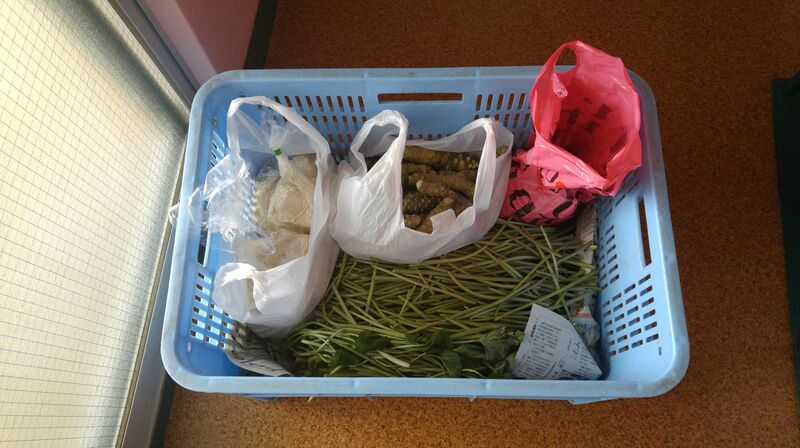 But I bought a batch of them today for the Missus to pickle (flowers, leaves and stems!)! 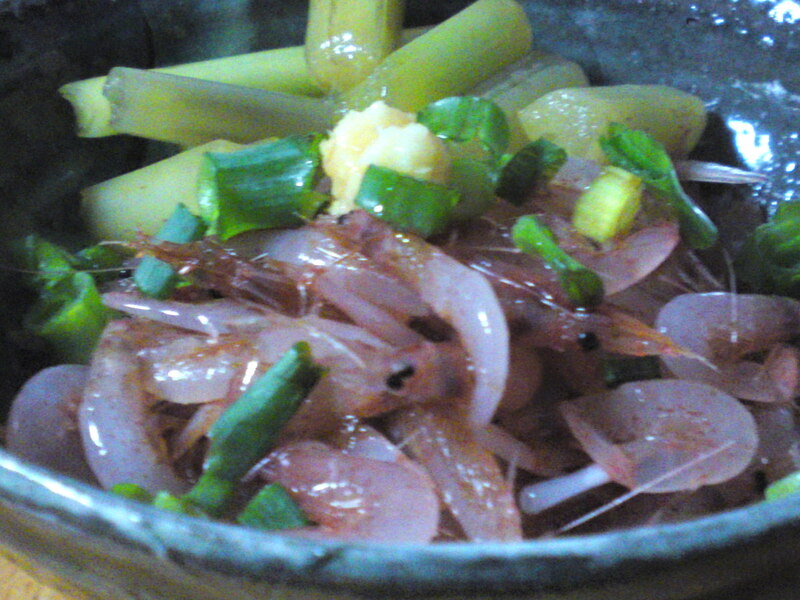 They are a beauty as condiment for freshly steamed rice!